In November of 2018 I lead an expedition for a small group of photographers to the frozen sea ice of Gould Bay in Antarctica to camp with and photograph Emperor Penguins. 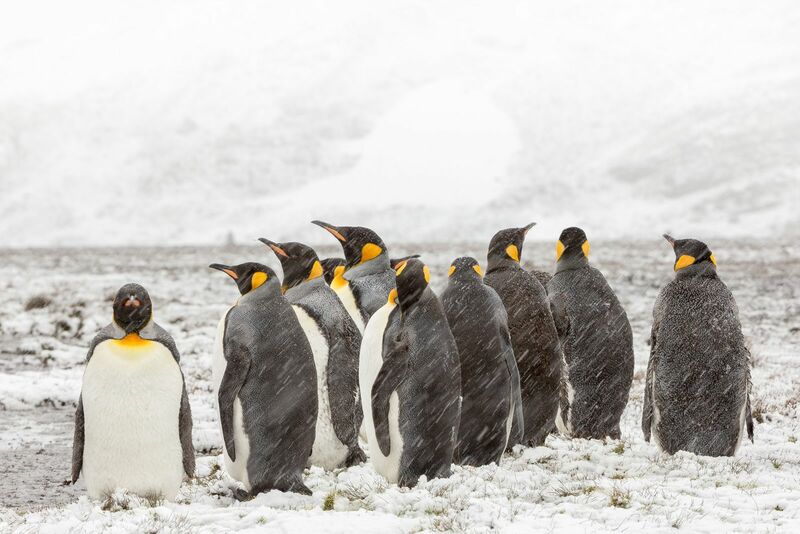 The colony at Gould Bay is actually the most southerly Emperor Penguin colony in Antarctica and is also one of, if not the most, difficult colonies to reach. This was my third expedition to this remote region of Antarctica and it proved extremely productive. This was also the first time I have been able to properly explore and photograph one of Antarctica’s dry valleys - a location not far from Union Glacier known as the Elephants Head. 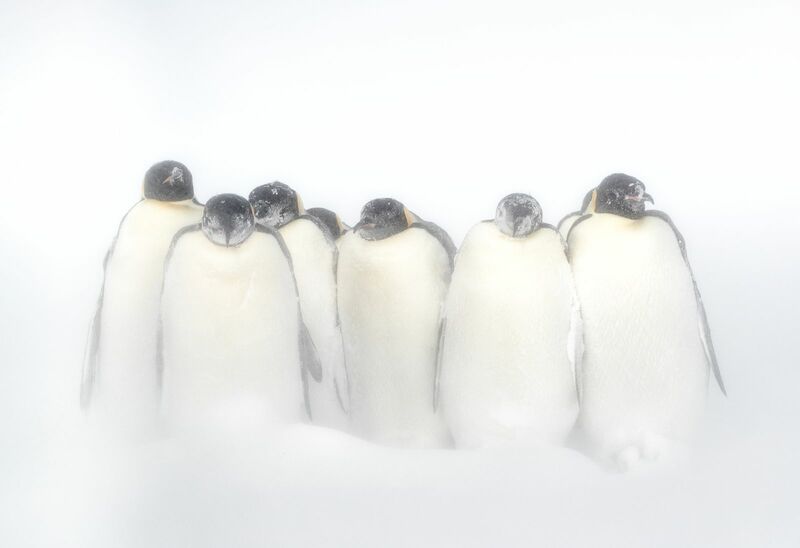 There are plenty of species the world over that are much harder to find than Emperor Penguins. To my knowledge however, none is as difficult or as expensive to reach as the Emperor Penguin; and thats the conundrum of Emperor Penguin photography. We know exactly where they are located, we just cant get to them without great difficulty and significant expense. 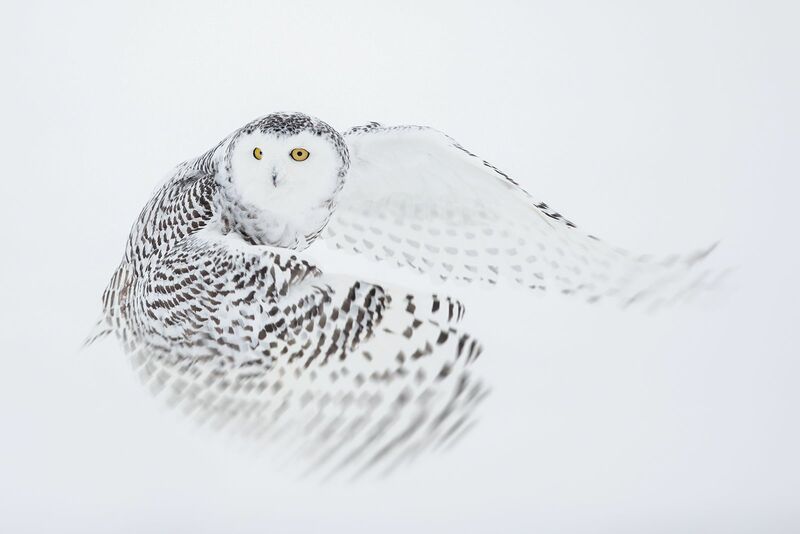 Living on the sea ice in remote and difficult to reach areas of Antarctica the Emperor Penguin is therefore as difficult to reach as the enigmatic snow leopard is to locate in the wilds of its mountainous territories. It is an odd problem for wildlife photographers to recognise and accept that we know exactly where our subject is located but that we just cant get to it. In October of 2018 this year I lead my semi-annual landscape and wildlife workshop to Namibia in Africa. This was my fourth workshop to the desert of Namibia and the first time I had ventured north into the wildlife rich region of Etosha. It was also the first time I have scheduled this workshop for October (instead of April / May when there is often more cloud). October was a deliberate choice for this safari as it is the end of the dry season in Etosha. Water is at its most scarce and the wildlife is thus forced to congregate around the last few remaining watering holes whilst they wait for the rains and the start of the wet season. It can be very hot this time year but I personally found it no worse than April / May and as it turned out we had the added bonus of clouds during our morning sessions at Deadvlei. We began our workshop in the capital city of Windhoek with a short one hour flight down to the coastal town of Luderitz where we spent the next three days photographing the Ghost town of Kolmonskop and the abandoned diamond mine at Elizabeth Bay. For 2018 I made the decision to fly the group from Windhoek down to Luderitz to save two days driving in the heat of the desert. This gave us more time for photography during our trip and saved many hours on the hot and dusty roads. The short one hour flight also gave us some absolutely spectacular aerial views of the landscape. 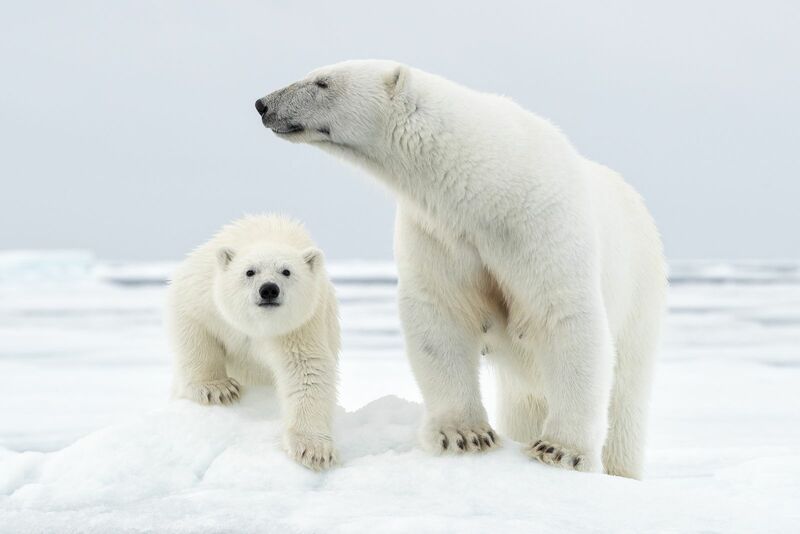 This July and August 2018 I lead my annual expedition north of Svalbard in search of Polar Bears, Walrus, Arctic Fox and of course spectacular Arctic landscapes – Polar Bears of Svalbard. With our small group of just twelve photographers and our ice hardened expedition class ship we were perfectly prepared for ten days of Arctic photography under the midnight sun (it turned out to be an absolute gem of an expedition). 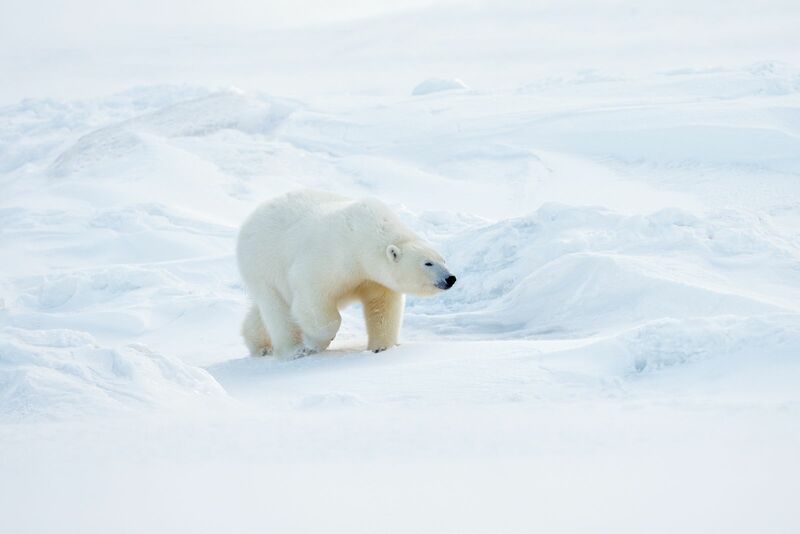 July and August are just a fantastic time of the year to visit Svalbard. With twenty four hours of daylight (the sun never sets this time of year) the opportunities for photography are literally non-stop and we took advantage on many occasions to photograph late into the evening and early hours of the morning. Working late into the night (when the sun is still low in the sky) not only extends the amount of time available for photography but it also offers the opportunity to work in a variety of lighting conditions. 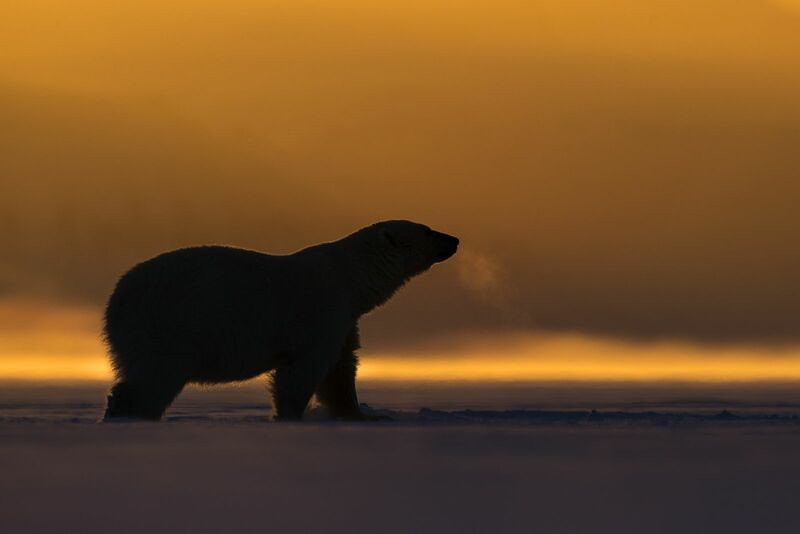 Typically late evening and early morning provide the softest light in Svalbard this time of year. With the option of working through the night we also have the luxury of being able to choose the best time of day or night to photograph in a given location. This years Masterclass workshop report is going to be a departure from previous years reports (its also my last New Zealand South Island Masterclass for the next few years). Rather than write my own report I am instead going to publish the report from Sebastien who documented our Masterclass on a day-by-day basis. My sincere thanks to all who participated on this workshop with extra special thanks to Sebastien for allowing me to post a summary of his report here. Be sure to check out his full report (including videos) and more of his photography from our workshop on his website HERE. I’ve experienced a once in-a-life time photo expedition to New Zealand. This has been a dream come true and thus, I decided to document every location and photo session to share with everyone what this beautiful country has to offer. Every day, I made three to four minute-videos for each day. I don’t handle long flights very well. I can’t sleep upright and I get a bit claustrophobic after a while. I knew New Zealand was far from Toronto. What I didn’t know is that it was going to be a 23 hour journey to Christchurch. I’m bringing with me all sorts of ridiculous pillows, an eye mask, earplugs and every single gadget you can imagine to keep myself entertained. In late March this year (2018) I lead my second ship based expedition to Svalbard in Winter to photograph the wildlife and arctic landscapes of this remote archipelago in a winter setting. The primary reason for choosing late March was at this time of the year (and at this latitude of nearly 80º North) the sun is very low in the sky all day and thus there is hours of golden light available for photography. Dawn and twilight light at this time of year typically last three or more hours and even at midday the sun is still very low in the sky. This situation provides hours and hours of superb light for photography. There is also something about the quality of light in winter at this latitude that translates very well into photographs. The light is soft and ethereal and often has wonderful pink and blue pastel shades not found at other times of the year. For the landscape photographer this combination of light, snow and ice is simply unmatched in my experience. This expedition was for just twelve photographers and utilised the same ice-hardened expedition class ship I have been using for Polar Bear photography over recent years. Amongst the twelve photographers was my surprise special guest for the expedition – French wildlife photographer Vincent Munier. It was an absolute pleasure to host Vincent for this expedition and on a personal note, it was a thrill for me to photograph the wildlife and landscape of Svalbard together (in particular the evening we spent photographing the full moon rising over the snow caped mountains). Our wildlife count for the trip included five Polar Bears, three Arctic fox, seven Walrus, seven Ivory Gulls plus a plethora of Reindeer and other sea birds. 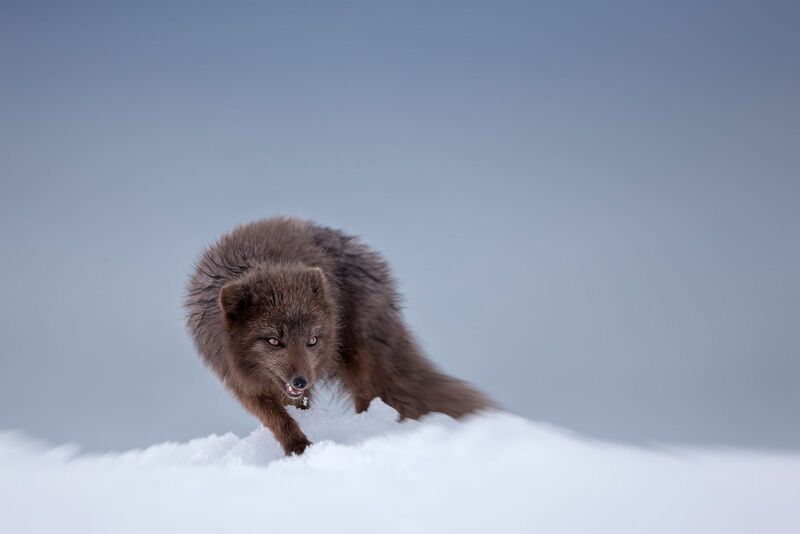 In February 2018 I lead my special small group expedition to the extreme north west of Iceland for a group of just five photographers to photograph what is perhaps Nature’s greatest survivor: Vulpes lagopus – The Arctic Fox. This is only the second time I have taken a small group with me into the nature reserve as this is an area very near and dear to my heart. I have been travelling to the Hornstrandir Nature Reserve (Hornstrandir is Iceland’s northernmost peninsula, covering 580 km² at the northern end of the Westfjords, to the north of the Jökulfirðir and to the northwest of Drangajökull) in Iceland during the winter months for five years now specifically to photograph Arctic Fox in winter. 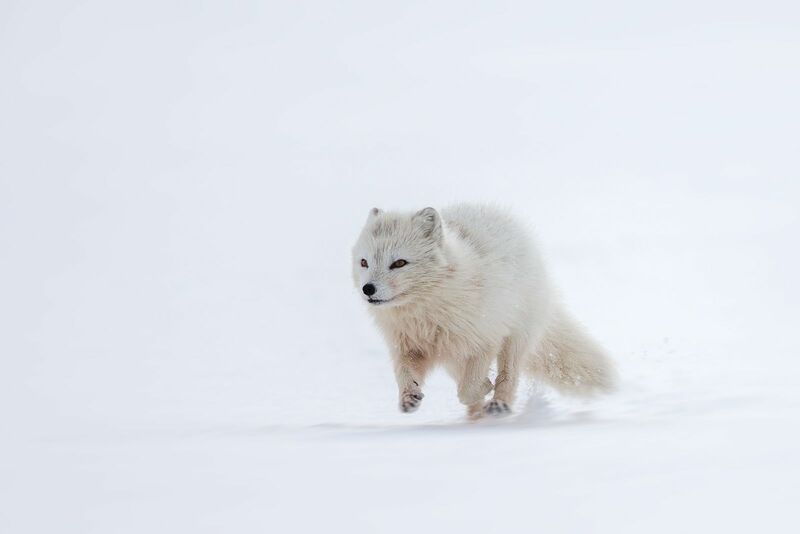 I released both a limited edition and open edition book on the Arctic Fox (Melrakki) which was the culmination of three years of winter photography. Prints from this book are now on display at the Arctic Fox centre in Sudavik and the book can be purchased directly through Melrakki Publishing. In March 2018 I led my second winter landscape workshop to the Lofoten Islands in Norway with long time good friend and fellow landscape photographer Martyn Lucas (I was last in Lofoten back in Winter 2016). As I have written previously, the landscape of these islands are really quite something to behold. 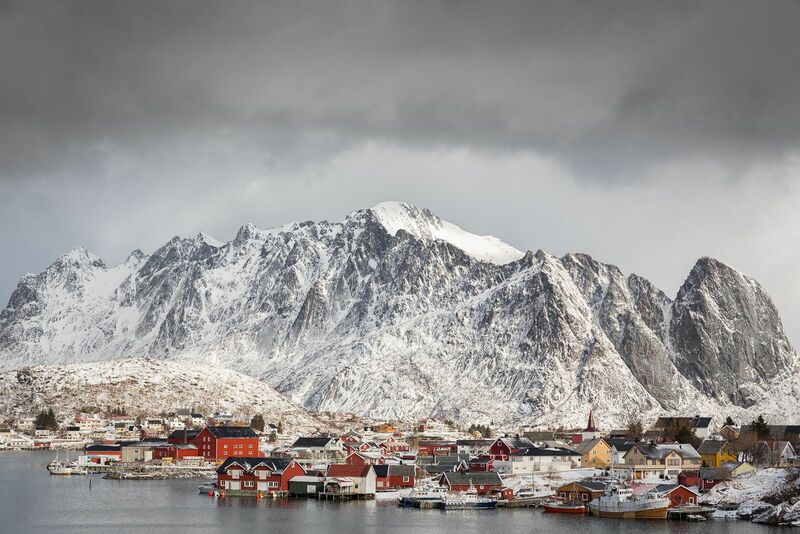 Precipitous and ominous peaks that rise straight out of the ocean loom over small fishing villages that comprise of bright red houses lining the shorelines. With a dusting of fresh snow and arctic winter light the entire scene is akin to a fairy tail location and subsequently the photographic opportunities can be truly superb. It is just this magical landscape that attracts so many photographers to this spectacular part of Norway. This workshop was a for a small group of just six experienced landscape and nature photographers. We based ourselves primarily in the small town of Reine and made daily excursions to various locations around the Island for photography. In November of 2017 I lead a dedicated photographic expedition to the Antarctic Peninsula – Antarctica, White Nature – in search of wildlife and dramatic landscapes. The expedition was deliberately timed as the first of the season as typically this is when the weather is still quite unstable in Antarctica and there is the greatest chance of dramatic weather and light. Expeditions later in the season (December, January and February) typically have more settled weather and far less snow coverage on the ground. For wildlife photography this can be problematic as it can be difficult to find clean snow backgrounds for the penguins (Read my guide on how to choose a photographic expedition to Antarctica). As it turned out fresh evidence of global warming was written all across the face of the Antarctic peninsula with unseasonably warm and stable weather that resulted in more blue sky days than I would have preferred for photography. In fact, there was a huge high pressure system sitting over the peninsula for the entire duration of the expedition (and the one that followed). To date, I have never seen so little snow, or such unseasonably warm and stable weather this early in November. Many of the glaciers I have become familiar with in recent years (such as those at Neko for example) are showing severe signs of melt and distress. Snow coverage was also lower than I have ever experienced in November. National Geographic recently published an outstanding article (July 2017) on the melt in Antarctica that should be mandatory reading for anyone even remotely interested in global warming (skeptics included). Titled: Antarctica; the bottom of the world as you have never seen it I recommend you try and pick up a copy. 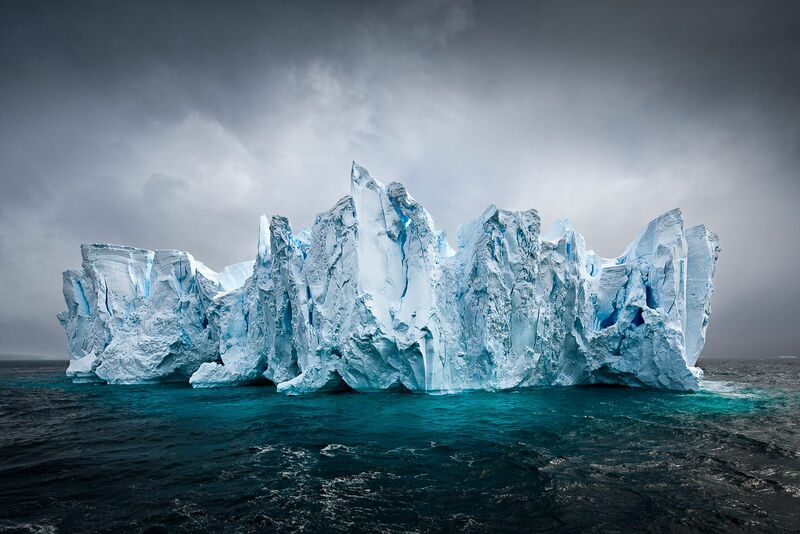 Putting the facts of the melt aside the underwater photographs by Laurent Ballesta that accompany the article are simply superb. There are few places on our planet as spectacular as the remote and wild east coast of Greenland. Its precipitous and towering glacier scarred mountains that line the many divergent fjords have created an otherworldly landscape that is just about photographic nirvana. 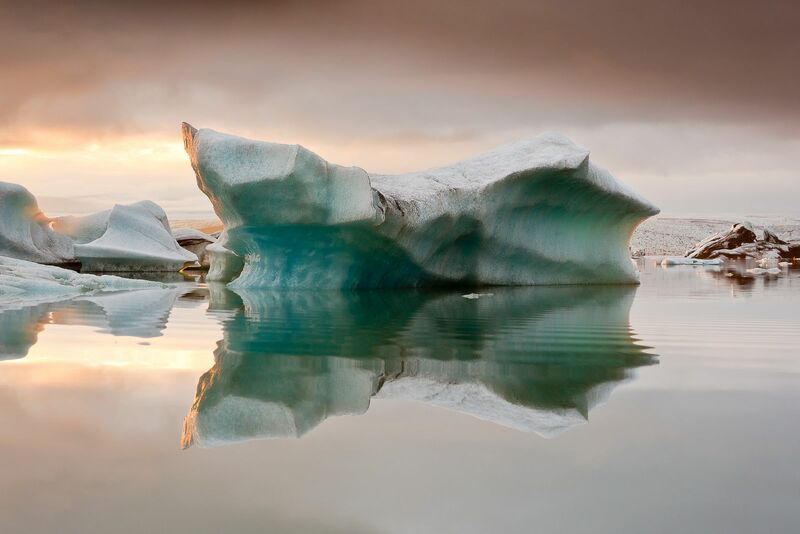 The entire primordial setting is festooned with a plethora of gigantic icebergs that drift slowly on currents through the system and that provide an endless and ever-changing series of subject matter for the photographer. It was this incredible, dramatic and dynamic landscape that first attracted and drew me to travel and photograph in Greenland (now many years ago). I had been itching to return since my last 2015 visit and so in September and October of this year (2017) I ran two back-to-back expeditions with my friend Daniel Bergmann to the remote east-coast and the incredible Scoresby Sund fjord system - The worlds largest fjord system. The expeditions were carefully timed as the last of the season in order to ensure Autumn colour in the dwarf birch, dramatic light (with real sunset and sunrise) and the first snows of winter. As it happened, we encountered all of this and much more. The first snows of winter was a key ingredient and with the mountain peaks garnished with a dusting of fresh snow during both our expeditions the stage was set for some superlative image making. This August 2017 I lead my annual summer expedition to the sea ice north of Svalbard in search of Polar Bears, Walrus, Arctic Fox, Arctic Birds and spectacular Arctic landscapes. 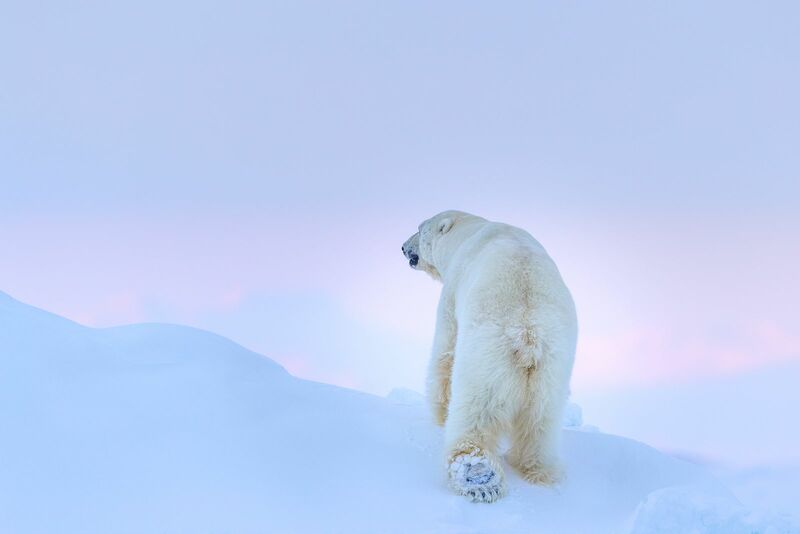 Whilst Polar Bears and other wildlife are the main attraction on an expedition such as this it needs to be said that the landscape opportunities in Svalbard are nothing short of breathtaking. Soaring bird cliffs, plunging glaciers and dramatic mountainous scenery means there is quite literally something for every photographer. Summer in the high arctic is a very special time for photographers. With twenty-four hours of daylight the photographic possibilities are quite literally as abundant as the day is long. 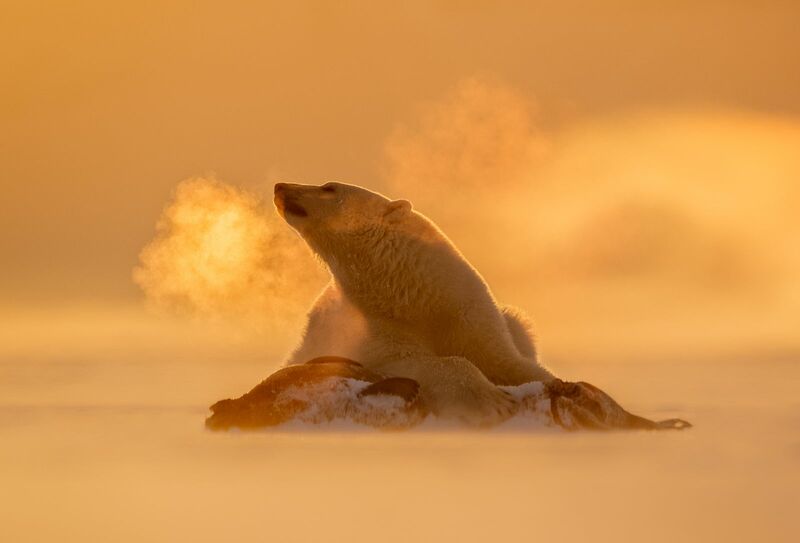 In fact, what would normally pass for night time is actually one of the best times for photography in the Arctic summer as the light is often soft and ethereal with subtle golden overtones. 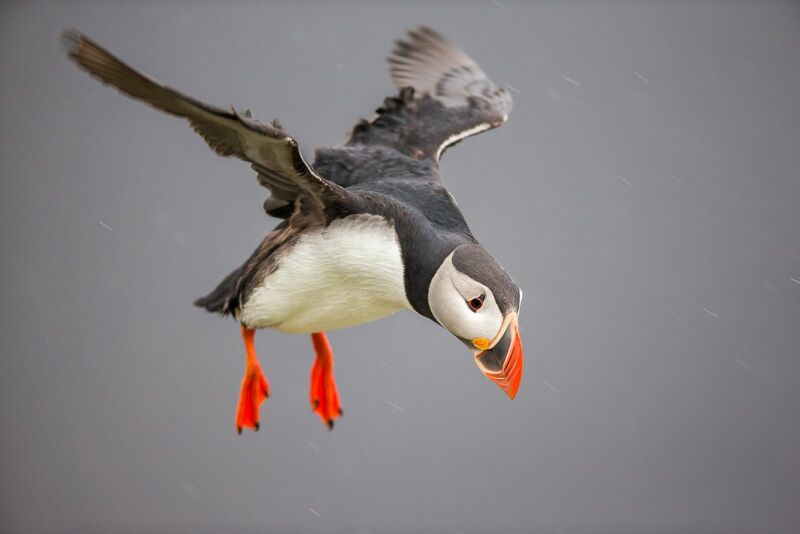 In May of 2017 Daniel Bergmann and l lead a new workshop to the north of Iceland specifically to photograph the Atlantic Puffin and other Arctic bird species. Iceland is one of the best places in the world to photograph Puffins and other Arctic birds in their natural environment and late May is the ideal time to ensure plenty of action in the colonies. Our plan was to focus the majority of our attention on Puffins; although we also planned to visit several different locations around Iceland to photograph different species. We had outstanding access to the Puffins living in burrows on the edge of sea cliffs during this workshop and we had timed our trip to ensure we were in the best locations at the best times to photograph these wonderful birds. There is a lot activity in the bird colonies in late May and early June and we were not disappointed with the sightings and displays. It has been more than two months now since my South Island New Zealand masterclass workshop and I have been a little remiss in writing up my trip report. Extensive travels and life have conspired against me and it has taken far longer than I would have liked to complete the report (I still have only processed a couple of images from the workshop and I am heading overseas again in just two weeks – Up to Svalbard for my Polar Bear summer expedition). Rather than give a day-by-day account of the trip this time (as I have done in the past) I felt it better to instead talk a bit about a typical day and what it is that we do other than take photographs during this sort of masterclass workshop. Whilst the physical act of photography is at the core of this workshop it is important impart that there is a lot more going on that just the act of setting up a tripod and pressing the shutter in great locations and beautiful light. In fact, I believe that some of the best learning that comes from these workshops actually happens away from the camera during meal time discussions. I have now finished the Iceland winter trip report. If you can please add this text and link for me. In late February 2017 I lead my annual Iceland Winter workshop with Daniel Bergmann. We have been running this workshop for the last five years now and have continually been refining our itinerary. For our 2017 workshop we based ourselves predominately in the north-east of Iceland which gave us access to some of the areas less frequented by the plethora of tourists that are flooding the south of Iceland these days (I will have more to say on this in a future post). We kept our daily itinerary moderately flexible in order to allow us to take advantage of the best conditions, weather and light. As it turned out, this approach has continued to provide us with fabulous opportunities. 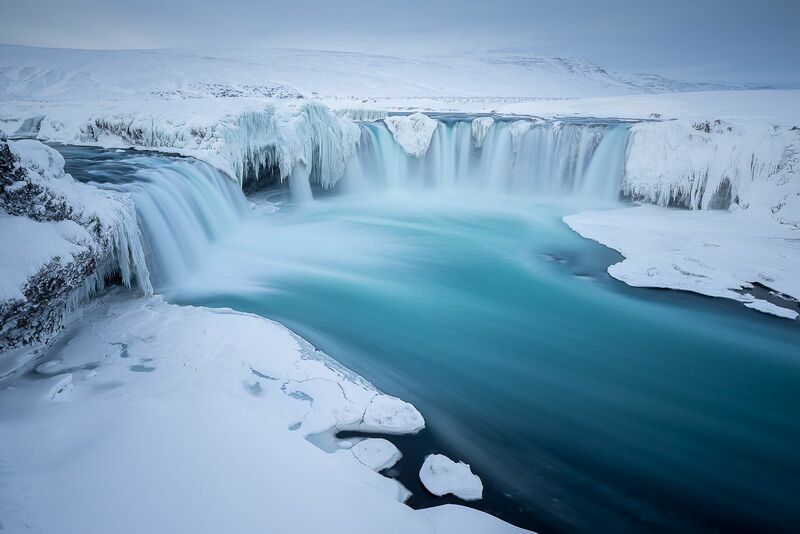 In particular this years workshop included a unique opportunity to access and photograph the spectacular waterfall Selfoss in a winter setting. I have been wanting to visit and photograph both Detifoss and Selfoss in winter for many years but conditions have hampered access in recent times. This year we were able to drive all the way to the car park and walk the kilometre and a half through compact snow to the very edge of Selfoss. The waterfall was in superb condition with some spectacular icicles hanging from its rocky edges and fresh snow along its banks. Iceland is well known for its waterfall photography and in my experience winter frequently offers the most interesting and dramatic opportunities to photograph them. 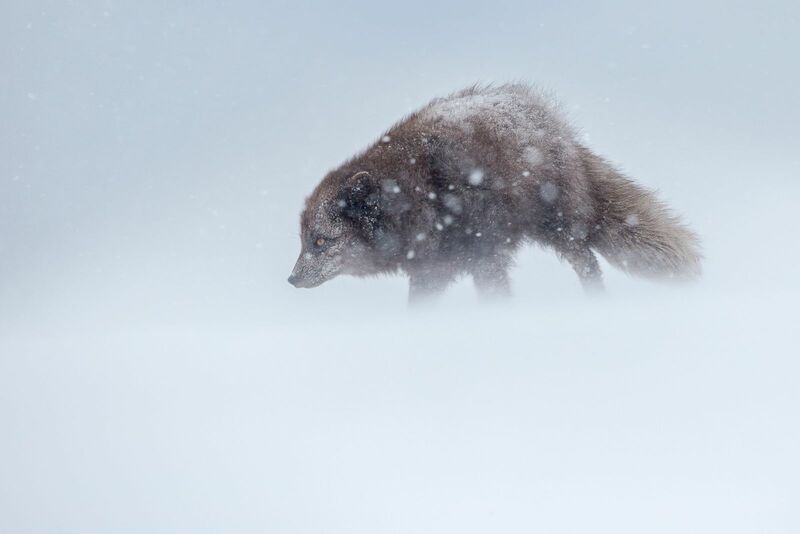 In early March 2017 I lead a new expedition to the extreme north west of Iceland for a small group of five photographers to photograph what is perhaps Nature’s greatest survivor: Vulpes lagopus – The Arctic Fox. I have been travelling to the Hornstrandir Nature Reserve (Hornstrandir is Iceland’s northernmost peninsula, covering 580 km² at the northern end of the Westfjords, to the north of the Jökulfirðir and to the northwest of Drangajökull) in Iceland during the winter months for four years now specifically to photograph Arctic Fox in winter. 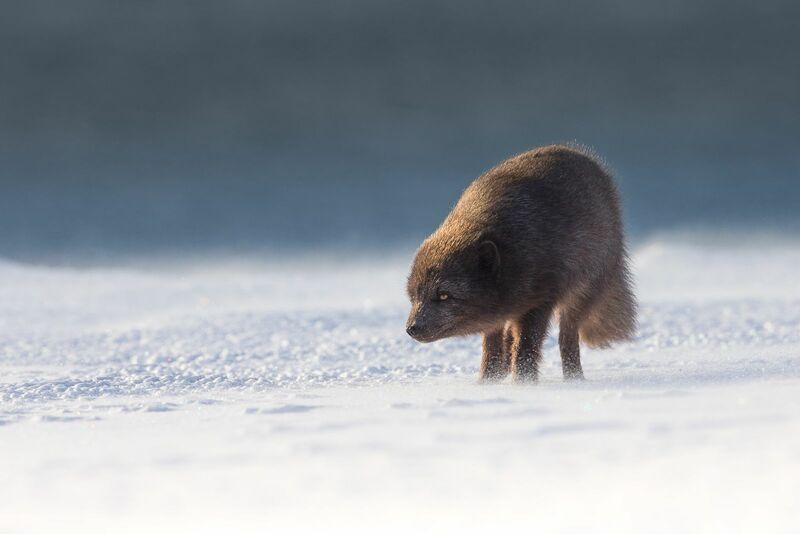 Late last year I released a new limited edition book on the Arctic Fox (Melrakki) which was the culmination of three years of winter photography. In late March 2017 I lead a new ship based expedition to Svalbard in Winter to photograph the wildlife and arctic landscapes of this remote archipelago in a winter setting. The primary reason for choosing late March was at this time of the year (and at this latitude of nearly 80º North) the sun is very low in the sky all day and thus there is hours of golden light available for photography. Dawn and Twilight light at this time of year typically last three or more hours and even at midday the sun is still very low in the sky. This situation provides hours and hours of superb light for photography. There is also something about the quality of light in winter at this latitude that translates very well into photographs. The light is soft and ethereal and often has wonderful pink and blue pastel shades not found at other times of the year. This combination of light, snow and ice is simply unmatched in my experience. In late July 2016 I lead my annual Polar Bears of Svalbard photographic expedition to the edge of the permanent pack ice north of Svalbard to photograph Polar Bears living and hunting in their natural environment. During the expedition we also photographed incredible arctic landscapes as well as other wildlife of the Arctic region including Walrus, Arctic Fox, Whales, Seals and a plethora of sea birds including the rare Ivory Gull (the rare Ross’s Gull remains an elusive species for me in Svalbard). This expedition was for a small group of just twelve passionate photographers and utilised a small ice hardened ship that enabled us to sail north directly into the pack ice in search of the king of the Arctic. In August and September of 2016 Daniel Bergmann and I lead two back-to-back workshops into the spectacular Highlands of Iceland. The first of these two workshops focused on the Highlands and northern areas of Iceland and the second on the Highlands and Southern region. We chose late August and September for our workshops due to the large increase in tourism in recent times in Iceland during the summer period. In truth, tourism is actually out of control now in Iceland and you absolutely must get off the beaten track if you want to get solitude in the wilderness. Part of our planning was to spend a large portion of our time in the more remote areas of the highlands in order to make sure we were well away from the masses. This proved most fruitful with spectacular landscape free from throngs of tourists. 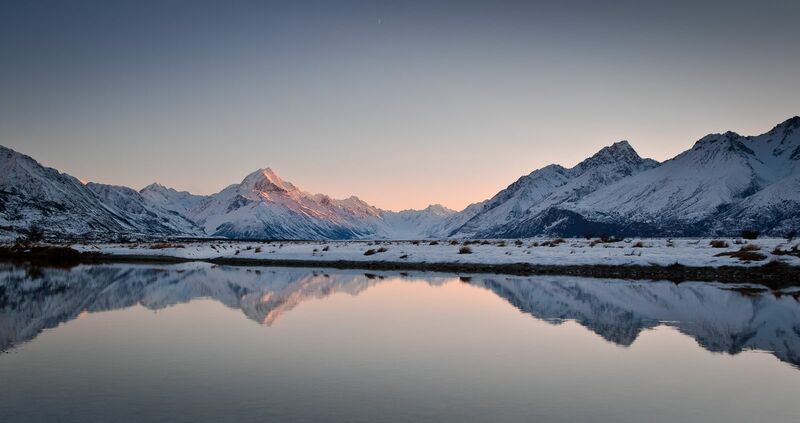 The South Island of New Zealand is home to some of the most spectacular scenery and landscapes in the world. Perhaps nowhere else in the world can one see and photograph precipitous mountains plunging into temperate rainforest and wild ocean beaches in so short a space. New Zealand is home to an unbelievably diverse range of subject matter, all packed together in a very small land area. Glaciers, majestic mountain ranges, moss-covered rain-forests, hidden valleys, and ocean-beaten coastlines are among the incredible array of natural wonders found there. It is an island of ever-changing weather and spectacular light conditions. To quote myself, it is a country made for photography. In March this year I led a new winter landscape workshop to the Lofoten Islands in Norway with long time good friend and fellow landscape photographer Martyn Lucas. If you are unfamiliar with Lofoten let me assure you that The landscape of these islands is really quite something to behold. Precipitous and ominous peaks that rise straight out of the ocean loom over small fishing villages that comprise of bright red houses lining the shorelines. With a dusting of fresh snow and arctic winter light the entire scene is akin to a fairy tail location and subsequently the photographic opportunities can be truly superb. This workshop was a for a small group of just six experienced landscape and nature photographers. We based ourselves primarily in the small town of Reine and made daily excursions to various locations around the Island for photography. Lofoten has become quite the hot spot for photography in the last few years (some are calling Lofoten the new Iceland) and although we did encounter a few other photographers during one of of our early morning sessions near town (where the above photograph was taken), we primarily had the place to to ourselves. It has been my experience in ‘hot spot’ locations such as Iceland and Lofoten that it is not too difficult to get away from other groups if you travel with someone who knows the terrain and have an experienced guide with you. Both Iceland and Lofoten have a number of iconic locations that everyone visits and photographs. However, both also have a vast number of excellent off the beaten track locations that are rarely visited and even less rarely photographed. On the whole, we preferred to spend the majority of our time in these less visited areas as the opportunity for unique photographs is greatly improved and you don’t have to fight for tripod space. In late February and March this year I lead my annual winter workshop to Iceland with good friend Daniel Bergmann. For our 2016 workshop we decided to head north for the second part of our trip and spend more time in areas less often visited during the winter months. Heading north in winter is always a bit of a gamble in Iceland in winter. Roads are often closed due to winter snow storms and it is possible to get stuck up north if there are a few days of very bad weather. Thankfully, we were never trapped by the weather, although it did throw up a series of challenges throughout our workshop. "In February 2016 I lead a dedicated photographic expedition into the Weddell Sea in Antarctica. Our aim was to get as far south as possible into the Weddell Sea in search of giant tabular icebergs and vast Adelie Penguin colonies. 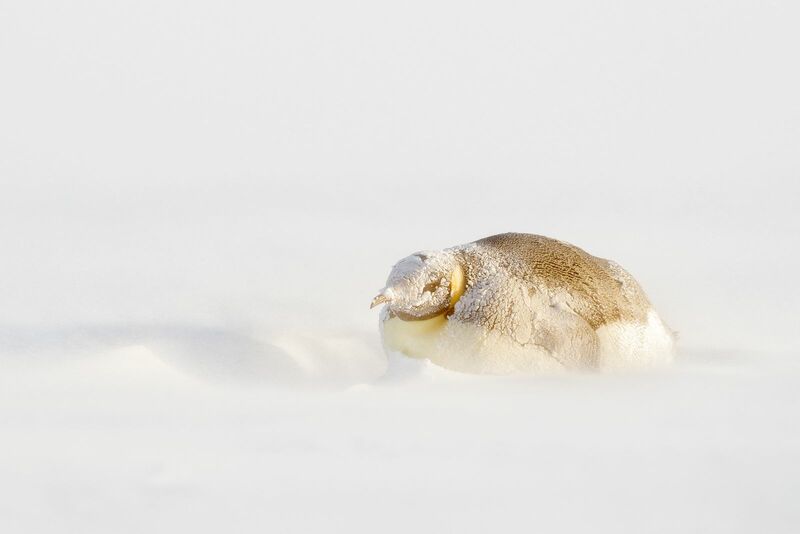 We hoped we may even visit Snow Island if conditions permitted and find the small colony of Emperor Penguins that lives on the island (As it happened the ice conditions prevented us from getting to Snow Hill). This was the first expedition I have lead that has ventured this far south into the Weddell Sea and it turned out to be a truly excellent experience. Antarctic Sound is well known for its giant tabular icebergs and it did not disappoint with some of the largest and most spectacular tabular icebergs I have ever had the pleasure to photograph. We were particularly fortunate early one morning (around 3am) to have superb light on the icebergs near the mouth of the sound. These magical moments are the real bread and butter of these expeditions. Standing on the deck of the ship photographing gigantic tabular icebergs in wonderful pre-dawn light is an experience that just stays with you forever." In late November 2015 I lead a seven day extension expedition for a small group of photographers to the Falkland Islands after we completed the 2015 South Georgia Expedition. The Falkland Islands are well known amongst birders and bird photographers as one of the best places in the world for observing many different species in such a small area (many of them at close proximity). Our intention, was to visit two of the world’s best hotspots for photography – Saunders Island (the Neck) and Sea Lion Island. We also payed a visit to one of the local areas (Gypsy Cove) in Stanley on our last evening in the Falklands. In November 2015 I co-lead an extended 15 day expedition to South Georgia Island with my good friends and partners Ole Jorgen and Roy Mangersnes. As is customary for me I like to write up a trip report on our experiences; both, so that there is a record of the trip for the photographers aboard, but also so I can share the experience with a wider audience. I have lead expeditions to South Georgia Island in past years, but this was the first time I had spent an extended period of time at the Island. Our plan for a 15 day expedition took a fair amount of logistical planning and permitting, but the end result was a fantastic amount of time for photography in what is in all likelihood the best location in the world for wildlife photography. As it so happens South Georgia is also home to some incredible landscapes with soaring Himalaya style peaks that provide the perfect back-drop. At the conclusion of the South Georgia Island expedition I lead a week long extension in the Falkland Islands for a small group of photographers. During this expedition we flew to both Saunders and Sea Lion Islands where we spent a number of days exploring the area and photographing the bird life. I will have a seperate report on this trip in the coming days. Photography guide and co-leader for the South Georgia trip Roy Mangersnes has actually beaten me to the trip report writing on this occasion so I am going to share his report from our expedition as it provides a really nice day by day insight into the expedition. I have added in my own thoughts and comments where appropriate. In July and August 2015 I lead two photographic expeditions to the edge of the permanent pack ice north of Svalbard to photograph Polar Bears living and hunting in their natural environment. During the expeditions we also photographed incredible arctic landscapes as well as other wildlife of the Arctic region including Walrus, Arctic Fox, Whales, Seals and a plethora of sea birds including the rare and angelic Ivory Gull and the even rarer Sabine Gull (the first time I have seen and photographed this gull). Both of these expeditions were for small groups of just twelve passionate photographers and utilised a small ice hardened ship that enabled us to sail north directly into the pack ice in search of the king of the Arctic. 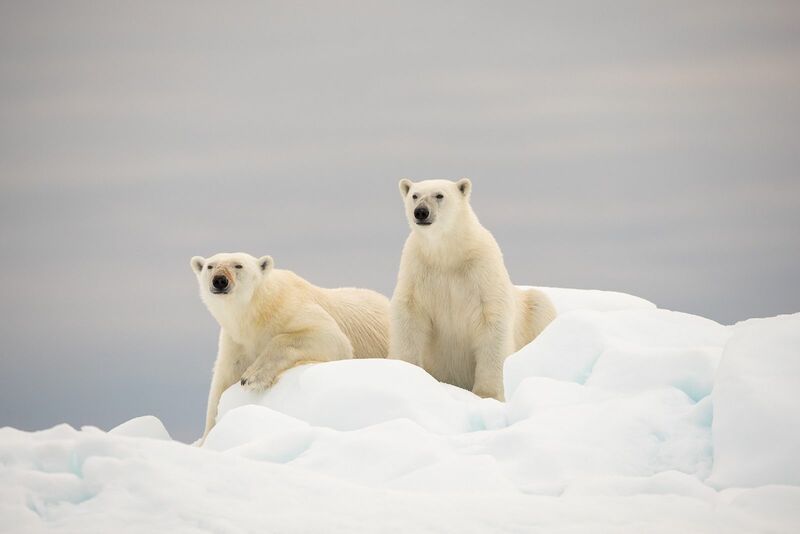 During both expeditions we were fortunate to see and photograph Polar Bears on the pack ice including a number of Bears on recent seal kills. 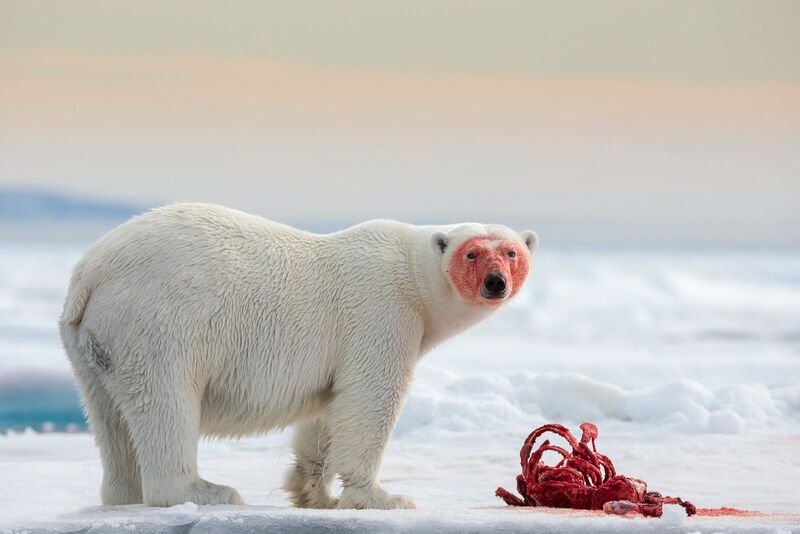 Seeing a Polar Bear on a seal kill is a very rare event and as luck would have it were able to photograph the kills and all aboard were able to capture some really fantastic photographs. In August this year I lead a new workshop into the highlands of Iceland with good friend Daniel Bergmann. 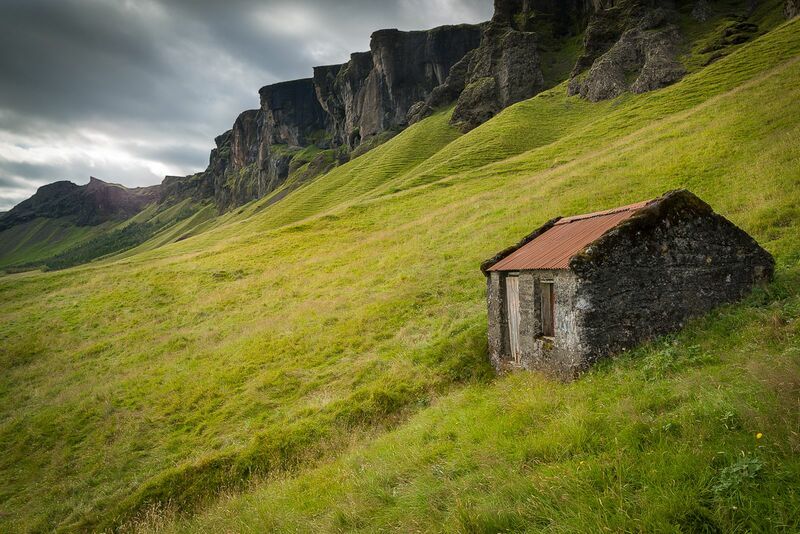 Our Highland workshop for 2015 took a different approach to previous workshops in that we made the decision to specialise in just a few areas of Iceland that we regard as some of the most spectacular – in this case we decided to spend the majority of our time in the Highlands and several other key locations. This approach enabled us to spend more time in our chosen areas and gave us better opportunities for good light. I am a strong advocate for spending as much time as possible in an area for photography and not moving from location to location too quickly. This approach both maximises the chances of really great light, but more importantly, it enables the photographer to slow down and get in tune with their surroundings and begin (hopefully) to see really strong compositions. It is actually exceedingly difficult to ‘hit the ground running’ in a new area and make great images right off the bat. More often than not the good images come after a period of time has elapsed and the photographer has had a chance to really tune into their surroundings. As always, our daily itinerary was dictated by the weather and light to enable us to maximise any opportunities and to avoid any bad weather. As planning (and a little luck) would have it we were able to run with our originally planned itinerary without any severe bad weather. In May 2015 I co-led my annual Autumn workshop to the South Island of New Zealand with co-nature photographer and friend Phillip Bartlett. Our 2015 masterclass workshop was a brand new itinerary that had been designed to provide us the best possible opportunities for photography utilising a number of different locations as bases in the South Island. We forgo trying to ‘do everything’ in the South Island in a single trip and instead focused our efforts on certain key areas to really maximise our chances to get everyone the best photographs. 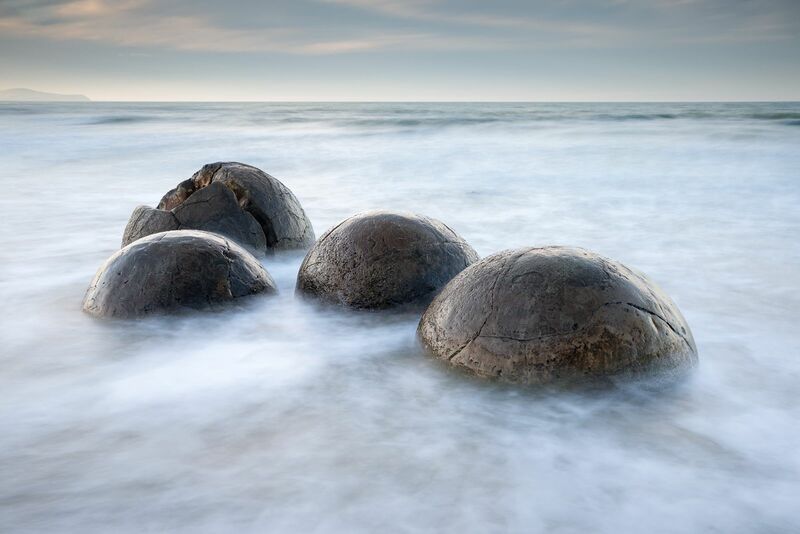 The South Island of New Zealand is home to some of the most spectacular scenery and landscapes in the world. It is no coincidence that Peter Jackson chose this part of the globe to film the Hobbit and the Lord of the Rings movies. Perhaps nowhere else in the world can one see and photograph precipitous mountains plunging into temperate rainforest and wild ocean beaches in so short a space. New Zealand is home to an unbelievably diverse range of subject matter, all packed together in a very small land area. Glaciers, majestic mountain ranges, moss-covered rain-forests, hidden valleys, and ocean-beaten coastlines are among the incredible array of natural wonders found there. It is an island of ever-changing weather and spectacular light conditions. It is a country made for photography. In February 2015 I led my annual winter workshop to Iceland with good friend, local guide and photographer Daniel Bergmann. This is the fourth year in a row I have led a dedicated winter trip for landscape and Northern Lights in Iceland. This year we were fortunate to experience some of the best light I have had the pleasure to photograph in during the winter months. It was also the coldest I can recall with snowfall down to sea level on several occasions. Iceland’s 2015 winter was one for the recent record books with greater snowfall, and colder temperatures than recent years. In early February 2015 I led a small photography group to Yellowstone National Park and the Grand Tetons for an exploratory winter workshop. This was my first time to Yellowstone in winter and very much a preliminary scouting trip for future workshops in the area. Winter is a wonderful time to visit America’s first national park; tourist numbers are very low by comparison with summer and the combination of snow and geothermal features offers outstanding landscape photography opportunities. 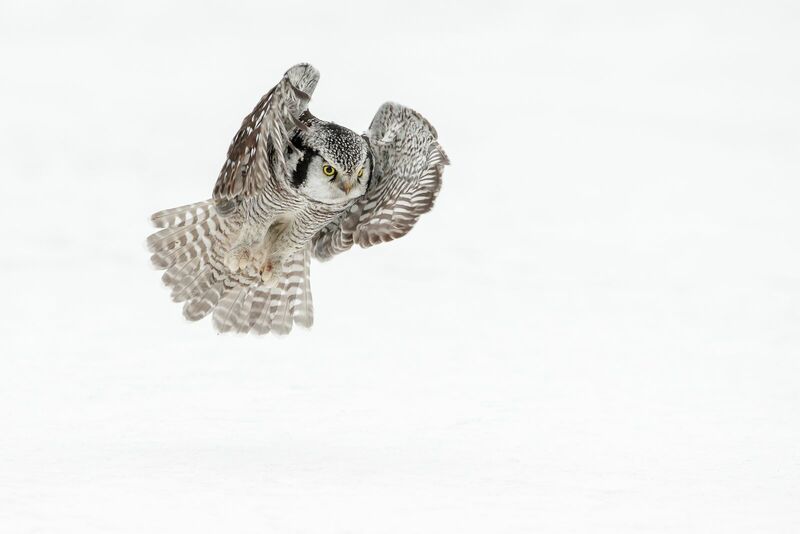 There is also an abundance of wildlife in Yellowstone and many opportunities to create really unique imagery in the snow covered landscape. Our plan was to photograph both the landscape and wildlife found in the park and take advantage of the winter snowfall. 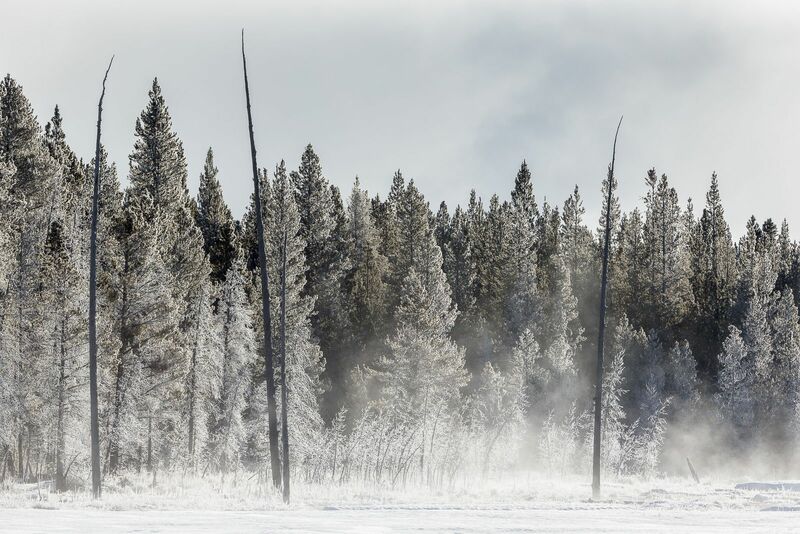 When visiting Yellowstone in winter there is a sense that you have almost crossed to another planet. The landscape is hushed by a thick blanket of snow. The trees are wreathed in frost and loom like wraiths against the ominous winter clouds. 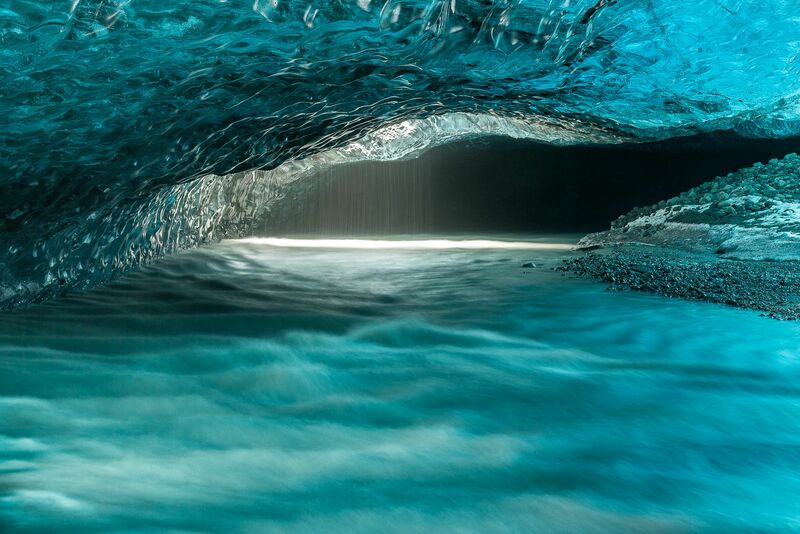 The crisp, icy air enhances the effect of the geothermal features. There is an exotic combination of mist-shrouded hot pools, bubbling paint pots and steaming fumaroles that is the ideal setting for winter landscape photography. Pro Photographer Antony Watson and I co-led a twelve day expedition to Antarctica in December 2014 - The Spirit of Antarctica. This expedition set sail from Ushuaia in South America and was designed as the ideal photographers first visit to Antarctica. We sailed across the notorious Drake Passage and visited some of the premiere locations for photography in Antarctica. We visited and photographed in some truly amazing locations including the breathtaking Lemaire Channel, the Gerlache Strait and the surreal geothermal Deception Island, to name but a few. There was even an opportunity to spend a night ashore photographing and camping in Antarctica for those who were feeling brave! We then return sailed across the Drake Passage before docking in Peurto Williams. A connecting flight then took us to Punta Arenas in South America where we concluded our expedition. In November 2014 Andy Biggs and I co-led a brand new and very exciting photography expedition to South Georgia Island and Antarctica. This twenty day (yes, 20 days!) photography expedition departed Ushuaia in South America on the 3rd of November 2014 and was designed to provide the definitive South Georgia Island photography experience. 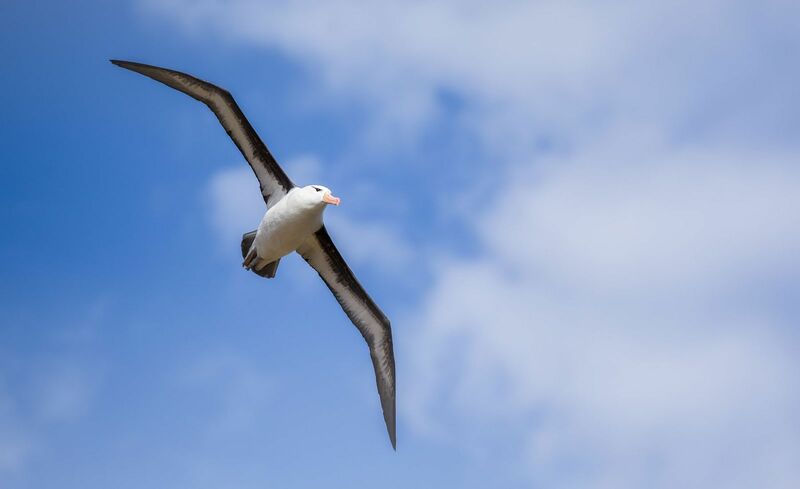 We sailed first to the Falkland Islands where we photographed nesting Black-Browed Albatross and comedic Rock Hopper Penguins. We then set sail for South Georgia Island where we saw and photographed the world's largest King Penguin rookeries, majestic albatross, seals and a plethora of bird life. Kelp strewn beaches were cluttered with basking elephant seals, feisty fur seals and hundreds of penguins that proved a wildlife photographers dream. Stromness and Grytviken harboured 3000 metre rocky peaks that rose up from the ocean to form amazing backdrops to the remains of whaling stations that met all our wishes for dramatic landscape. South Georgia’s remote, untamed landscape was simply stunning. Scattered across the mighty Southern Ocean, the tiny arc of windswept islands and harbours are some of the world’s greatest wildlife sanctuaries set against world class landscapes. Famed for its abandoned whaling stations and Shackleton’s heroic journey, South Georgia is home to literally millions of fur seals and penguins, wallows of elephant seals, and nesting albatross. South Georgia Island proved an absolute paradise for wildlife and landscape photography. After South Georgia we steamed south to the Antarctic Peninsula where we spent time photographing amazing icebergs and the spectacular Antarctic landscape. 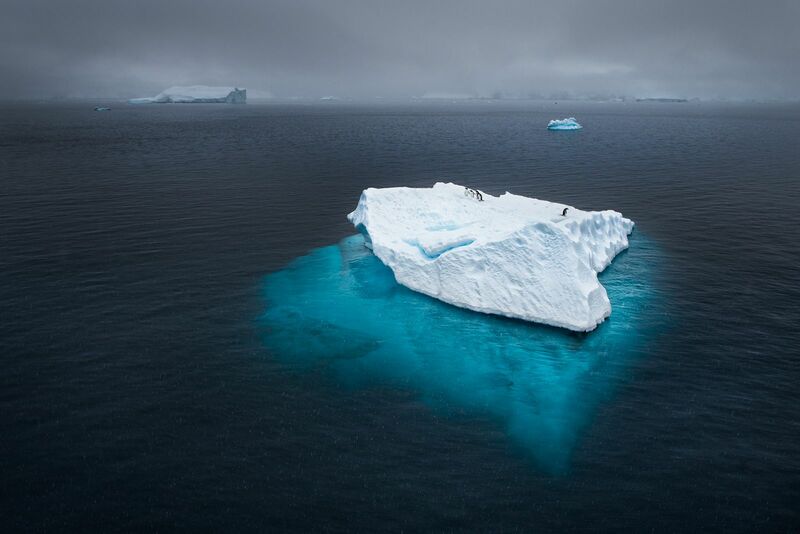 We were fortunate to encounter some gigantic tabular icebergs coming out of the Weddell Sea and we were able to take advantage of the situation to create some amazing photographs. 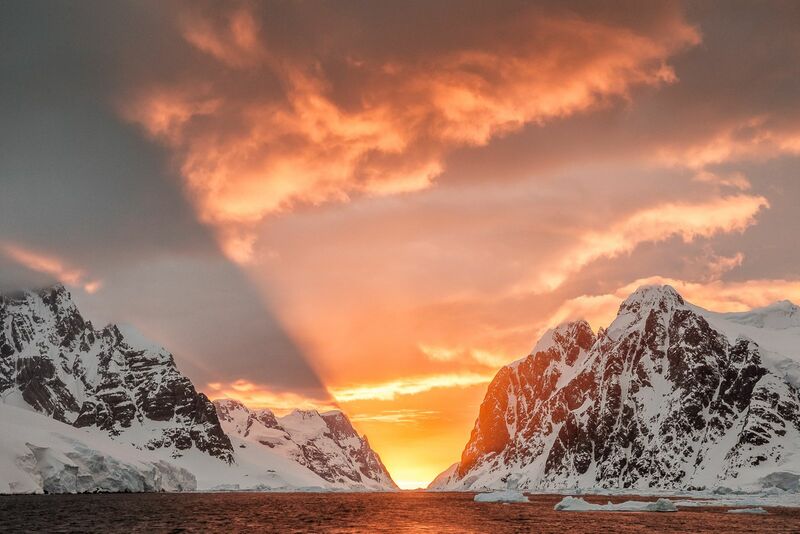 We sailed through the spectacular Lemaire Channel under an incredible Antarctic sunset and explored many of the peninsula’s islands, bays and coves. After we finished photographing in Antarctica we sailed back to Ushuaia where we docked on the 22nd of November and concluded our expedition. In August and September 2014 I co-led a photographic expedition to Greenland and Svalbard aboard the expedition ship ‘Polar Pioneer’. We set sail from Isafjordur in Iceland and sailed across the Denmark Strait where explored the incredibly wild and rugged East Coast of Greenland. We navigated many of the fjords, encountering incredible icebergs the size of city blocks as well as rugged mountains that plunged steeply into the dark arctic waters. We then sailed across the Greenland sea and explored the amazing glaciers and arctic landscape of Svalbard before docking in Longyearbyen where we concluded our voyage. This expedition combined the very best of Greenland and Svalbard and provided us with truly amazing photographic opportunities - The 'Jewels of the Arctic'. Spitsbergen’s rugged northwest coast comprises mountains, tundra and fjords. 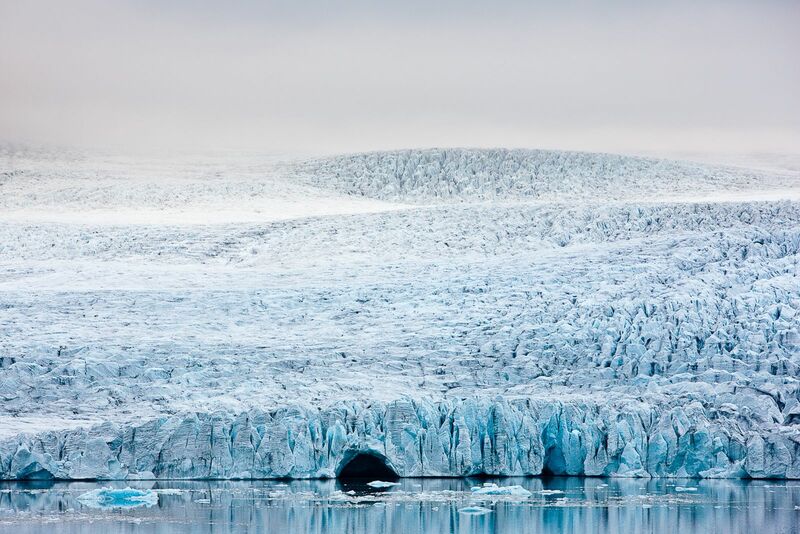 Greenland’s remote east coast shows off the immensity of the icecap, fantastic icebergs and massive granite spires rising over 1000 metres above the fjords. The arctic landscape is one of untold splendour and beauty and this expedition was designed to maximise the photography opportunities. The expedition was for a strictly limited number of 50 participants plus leaders and expedition guide. We utilised the ice hardened expedition ship ‘Polar Pioneer’ with a highly experienced crew in order to ensure we could get as close as possible to big ice and place us in the best locations for making photographs. Our expedition ship was equipped with sufficient zodiacs and crew for all photographers to be shooting simultaneously with plenty of room to spare for our camera equipment. 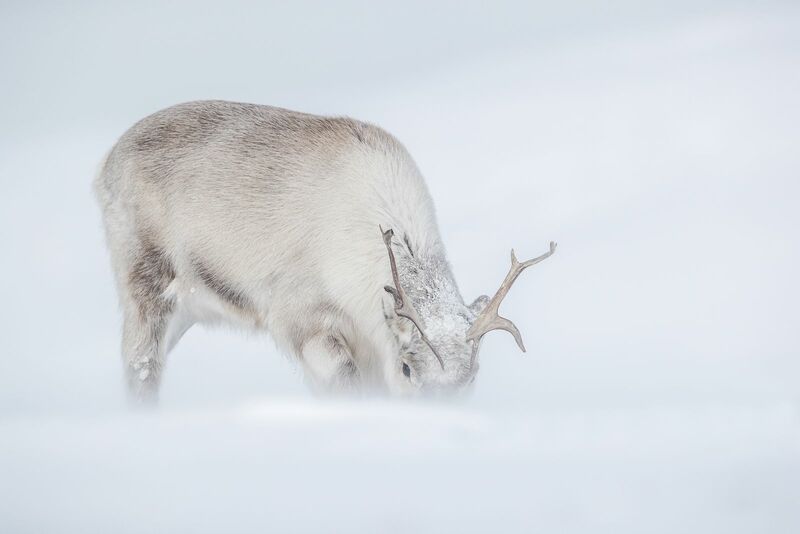 The expedition offered a complete Arctic experience for photography: tundra walks amidst reindeer and exquisite dwarf vegetation, zodiac cruises near icebergs and calving glacier fronts, hikes to breathtaking mountain vistas and warm welcomes into indigenous communities. We saw and photographed reindeer, Musk Ox, countless sea and land birds, walrus, seals, and whales amongst the breathtaking arctic landscapes. In July and August 2014, I co-led two back-to-back workshops to Iceland with my good friend and Pro Nature Photographer Daniel Bergmann. These workshops included brand new itineraries that we custom designed to take in the very best of Iceland under the spectacular Midnight Sun. Our workshops saw us circumnavigate the entire Island and primarily focused on the spectacular highland and coastal landscapes of Iceland. Normally inaccessible in winter, the interior of Iceland, known as the highlands, is an extraordinary place for landscape photography. It is a landscape of contrasts; wide vistas and pristine wilderness, mountain ranges, glaciers, waterfalls and geothermal volcanic features. Iceland is one of the most exciting and rewarding photography locations in the world and during these workshops we visited a great many of its natural wonders. During the workshops we photographed Glaciers and geothermal areas, waterfalls and lush green valleys, sub-arctic tundra, majestic mountains, icebergs and black volcanic beaches. We experienced the ever changing weather and spectacular light conditions that Iceland is renowned for. 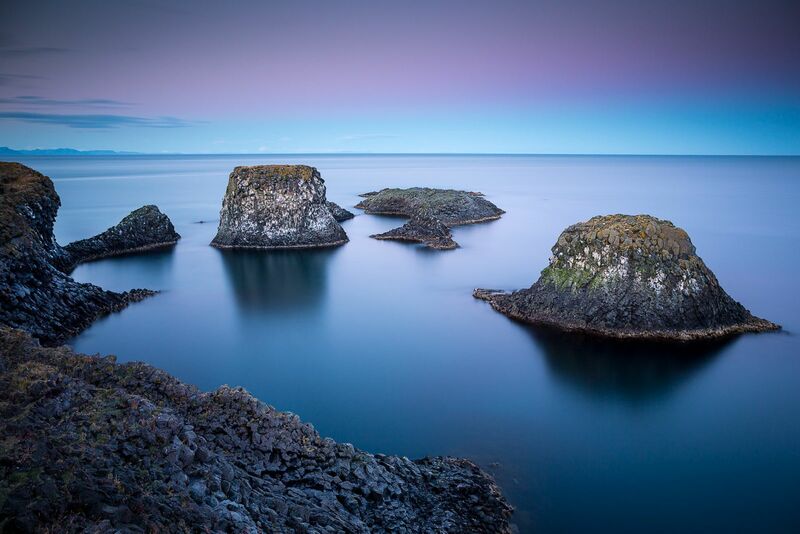 These 2014 Iceland Ultimate Summer Workshops were CPD (Continual Professional Development) accredited by the AIPP (Australian Institute of Professional Photographers). Please be sure to visit the Testimonials page for client feedback on what were extremely successful workshops. In March and April 2014, I co-led back-to-back workshops with Andy Biggs to the Namibia desert in Namibia, Africa. The goal of these safaris was to photograph the breathtaking desert landscapes of Namibia in a different way than Andy has offered on his Namibia trips in the past: in an overland fashion. These were overland photographic journies, and we had complete flexibility to stop to take photographs at any time along the way. We wanted to put these trips together that had a good balance between flexibility, photographic opportunities and comfortable accommodations. This approach also enabled us to carry more than enough amount of camera baggage, so we were able to bring everything we needed. On the South Western Coast of Africa, where the icy Atlantic ocean meets the world’s oldest desert lies a place that is known for its landscapes as much as the Serengeti is known for its abundant wildlife. The unique combination of desert, grassland and cold ocean current form a one-of-a-kind terrain found only here. For this reason landscape photographers from all over the world journey to the Namibia Desert to try and capture its ethereal beauty. 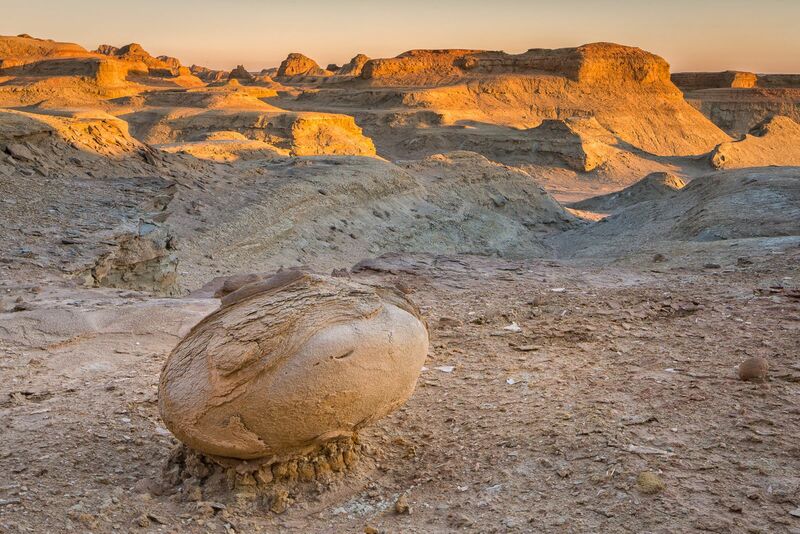 In this captivating region of Namibia lies a maze of mountainous valleys that look like they were carpeted from slope to slope by ivory coloured grass, criss-crossed by ancient riverbeds and dotted with a collection of photogenic acacia trees. 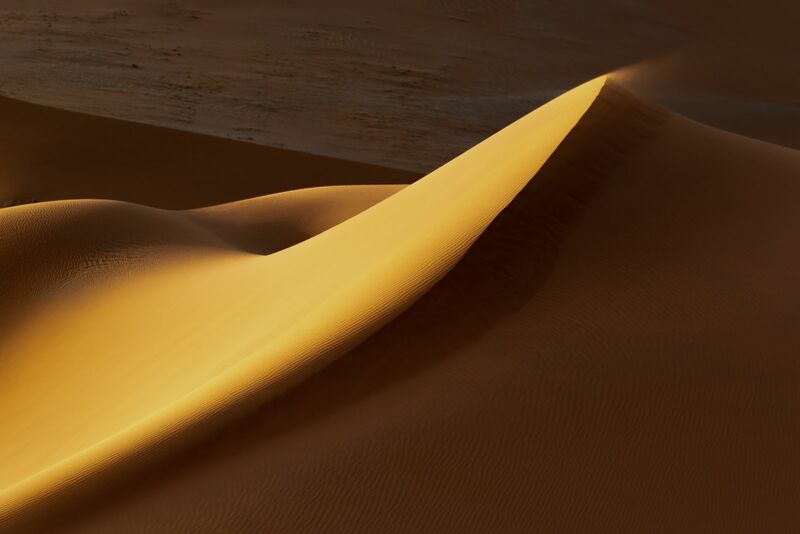 The final unique touch is added by the large snake like dunes that rise from the grasslands like the roof of some subterranean world. These stark and compelling landscapes are something to behold with the human eye, but when it’s sweeping meadows, barren mountains and blood red dunes are captured and transformed into a two dimensional image, it becomes obvious why this place is so beautifully addictive to photographers. 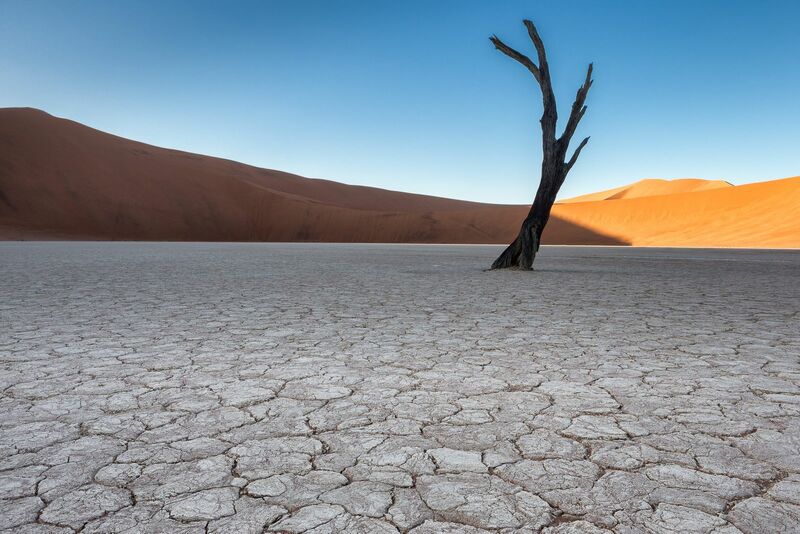 These new safaris were custom tailored to take in the very best of Namibia and included such iconic areas as the mystical Deadvlei, the ghost town of Kolmanskop and the Dune landscapes of Sussusvlei. In March 2014 I co-lead a winter Aurora workshop to Iceland with my good friend and fellow Pro Nature Photographer Daniel Bergmann. This photography workshop focused on the spectacular geothermal area at Myvatn as well as ice-caves, Northern Lights (Aurora), glaciers, partially frozen waterfalls and coastal landscapes of Iceland. The days were starting to get longer in March, which provided us with some fantastic soft light on what was often a freshly snow covered landscape. 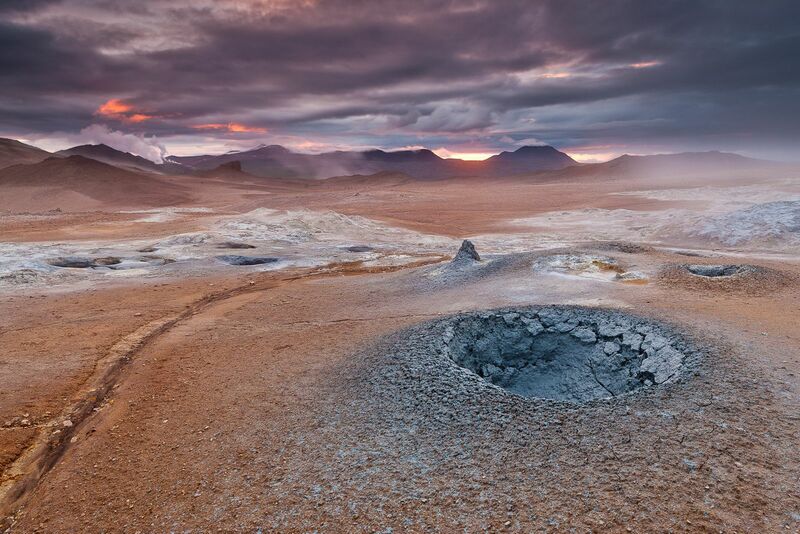 On this workshop we photographed the spectacular northern geothermal landscapes found around Myvatn and Namafjall. We also visited and photographed the crystal clear glaciers and icebergs found at the Vatnajökull ice cap and Jökulsárlón glacial lagoon. We even experienced and photographed the amazing natural phenomena of the Aurora Borealis (Northern Lights) on our last full day in Iceland. Please be sure to visit the Testimonials page for client feedback on what was a successful workshop. Late February 2014 I returned home from a brand new Summer workshop to the South Island of New Zealand with my good friend Phillip Bartlett. 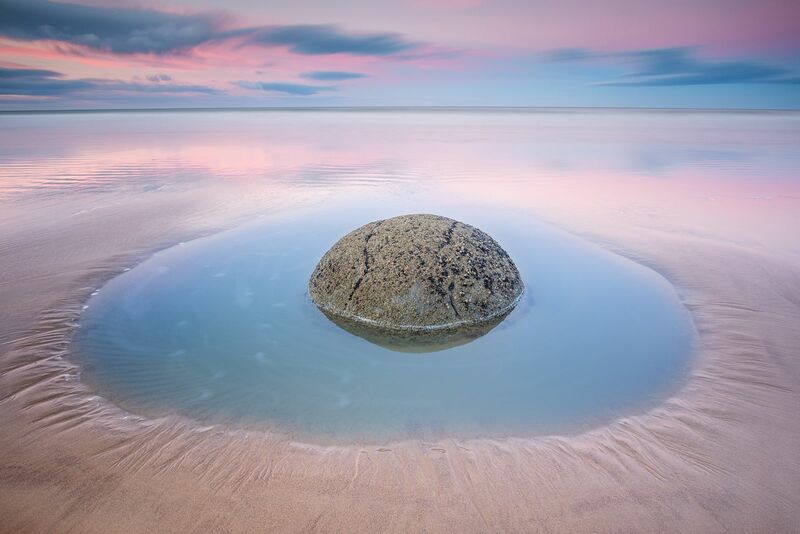 Our workshop took us on a photographic journey into ‘Middle Earth’ – The spectacular South Island of New Zealand. In case you have not seen the Lord of the Rings movies, the South Island of New Zealand is home to some of the most spectacular scenery and landscapes in the world. It is no co-incidence that Peter Jackson chose the South Island of New Zealand to film the Hobbit and the Lord of the Rings movies. Perhaps nowhere else in the world can one see and photograph precipitous alpine mountains plunging into temperate rain forest and wild ocean beaches in so short a space. 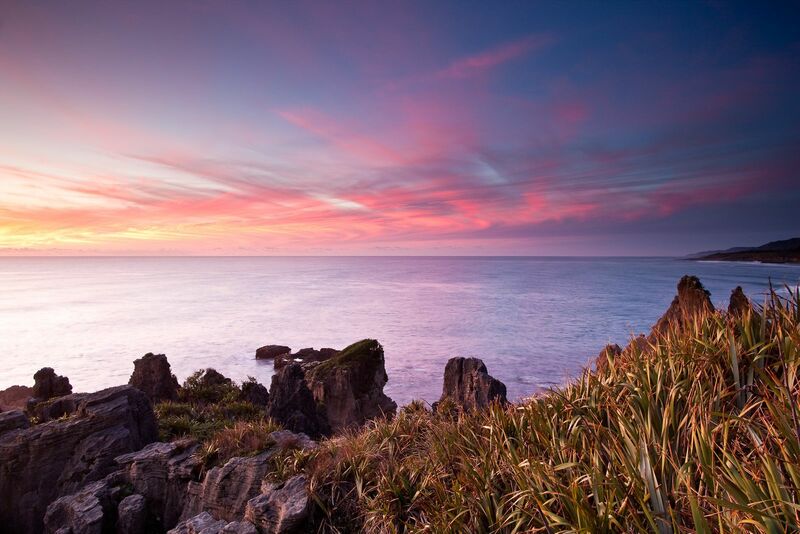 New Zealand is home to an incredibly diverse range of subject matter in a small island. Glaciers, waterfalls, spectacular valleys, imposing mountain ranges and black pebble beaches. It is an island of ever changing weather and spectacular light conditions. It is a country made for photography. Our workshop took us on an eleven night / twelve day odyssey around the South Island to many of its iconic locations and some of its lesser known gems. During our travels we experienced some incredible weather and light as well as some fantastic landscape and wildlife photography opportunities. Two of the main highlights of this workshop included a privately chartered helicopter flight with the doors removed for photography over Fox and Franz Josef Glaciers and the awe inspiring Southern Alps and a privately chartered boat in Kaikoura to photograph Albatross and playful Dusky Dolphins. Both of these experiences were regarded by all on this trip as once in a lifetime and not to be missed. 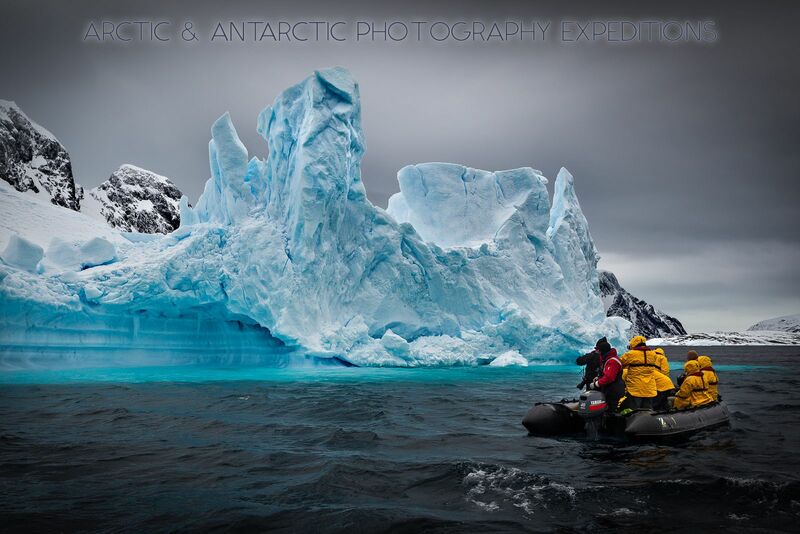 In November 2013 I lead a dedicated photographic expedition to Antarctica with my good friend Daniel Bergmann. This expedition had been more than twelve months in the planning and utilised the ice hardened expedition class ship ‘Polar Pioneer’. Polar Pioneer is an ex Russian survey ship that has been refitted for polar expeditions to both Antarctica and the Arctic. 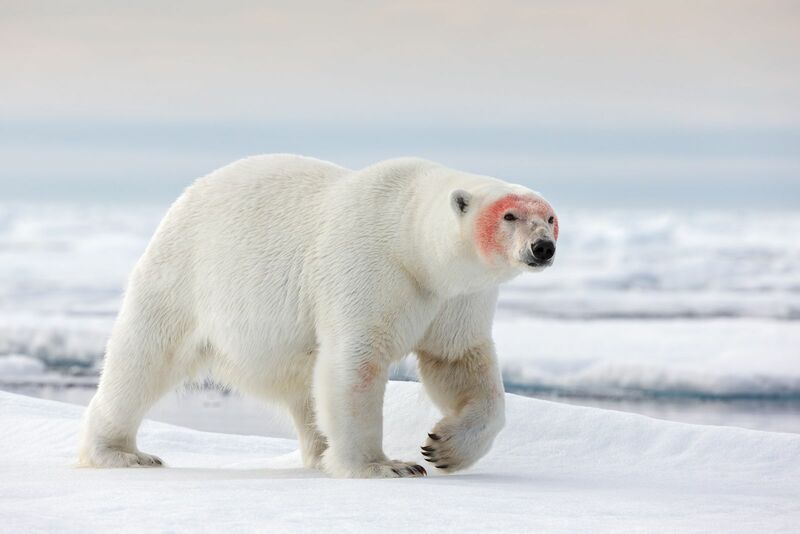 It’s ice hardened hull and low decks make it the ideal vessel for polar photography. The expedition was for a strictly limited number of 50 participants plus leaders and expedition guide and offered an extended period in Antarctica (15 Day / 14 night Expedition). Whilst most trips to Antarctica take 100+ tourists this expedition was capped at a maximum of 50 dedicated photographers in order to ensure the best possible experience for all aboard. As it turned out we ended up with just under 50 due to a last minute cancellation which worked in our favour with a smaller number of photographers per zodiac. Many first time Antarctic travellers are unaware of the benefits of travelling in small groups such as this. It is worth noting that many of the locations in Antarctica forbid landing more than 100 people at a time. That means that if you are part of a much larger group you have to draw lots and wait your turn to go ashore and likely miss out on opportunities and great light. We had no such restrictions on this expedition and were able to land all of those photographers who wished to go ashore at each of our chosen landing points. 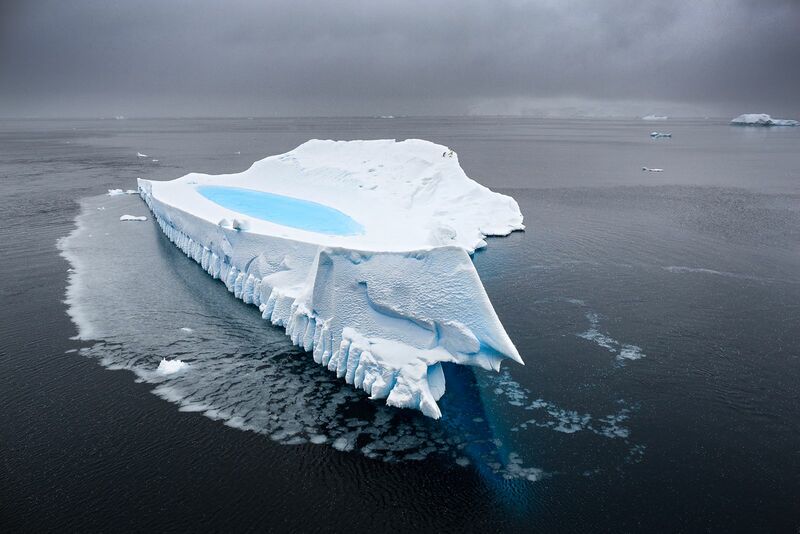 The expedition included special access into areas normally restricted to scientific research (including the Polish Station ‘Arctowski’), as well as taking in amazing locations such as the breathtaking Lemaire Channel, the Gerlache Strait and the surreal geothermal Deception Island, to name but a few. Please be sure to visit the Testimonials page for client feedback on what was a fantastic workshop. In August 2013 AIPP Grand Master of Photography Peter Eastway and I co-lead a 14 day / 13 night photographic expedition to Svalbard and Greenland - The Jewels of the Arctic II. The trip set sail from Isafjordur in Iceland and took in the very best of Greenland and Spitsbergen before docking in Longyearbyen in Svalbard, Norway. This expedition was a reverse trip of the previous Jewels of the Arctic adventure. 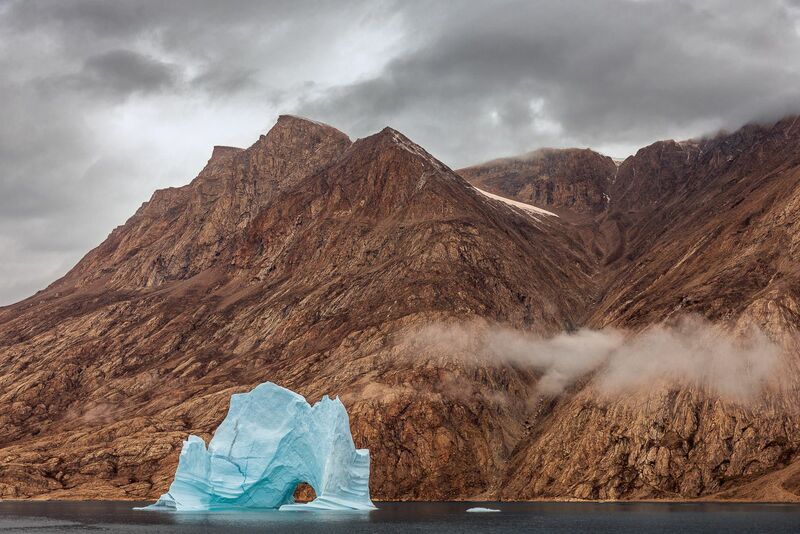 Greenland’s remote east coast showed off the immensity of the icecap, fantastic icebergs and massive granite spires rising over 1000 metres above the fjords. Spitsbergen’s rugged northwest coast comprises mountains, tundra and fjords. The arctic landscape is one of untold splendour and beauty and this expedition was designed to maximise the photography opportunities we encountered. The expedition utilised an ice hardened expedition ship with a highly experienced crew in order to ensure we got as close as possible to big ice. This expedition offered a complete Arctic experience for photography: tundra walks amidst reindeer and exquisite dwarf vegetation, zodiac cruises near icebergs and calving glacier fronts, hikes to breathtaking mountain vistas and warm welcomes into indigenous communities. We saw and photographed reindeer, musk ox, countless sea and land birds, walrus, seals, whales and polar bears amongst the breathtaking arctic landscapes. We had nearly 24 hours of daylight with hours and hours of golden light. At our most northerly position we were approximately 600 miles from the North Pole. Please be sure to visit the Testimonials page for client feedback on what was a fantastic workshop. In August 2013 Daniel Bergmann and I co-lead a new 14 day / 13 night photographic expedition to Svalbard and Greenland - The Jewels of the Arctic. The trip set sail from Longyearbyen in Svalbard, Norway and took in the very best of Spitsbergen and Greenland before docking in Isafjordur in Iceland. Spitsbergen’s rugged northwest coast comprises mountains, tundra and fjords. Greenland’s remote east coast shows off the immensity of the icecap, fantastic icebergs and massive granite spires rising over 1000 metres above the fjords. The arctic landscape is one of untold splendour and beauty and this expedition was designed to maximise the photography opportunities. The expedition utilised an ice hardened expedition ship with a highly experienced crew in order to ensure we got as close as possible to big ice. This expedition offered a complete Arctic experience for photography: tundra walks amidst reindeer and exquisite dwarf vegetation, zodiac cruises near icebergs and calving glacier fronts, hikes to breathtaking mountain vistas and warm welcomes into indigenous communities. We saw and photographed reindeer, musk ox, countless sea and land birds, walrus, seals, whales and polar bears amongst the breathtaking arctic landscapes. We had nearly 24 hours of daylight with hours and hours of golden light. At our most northerly position we were approximately 600 miles from the North Pole. Please be sure to visit the Testimonials page for client feedback on what was an amazing workshop. In mid July 2013 I lead a summer workshop with Daniel Bergmann focusing on the coastal landscapes and spectacular highland regions of Iceland. Normally inaccessible in winter, the interior of Iceland, known as the highlands, is an extraordinary place for landscape photography. It is a landscape of contrasts; wide vistas and pristine wilderness, mountain ranges, glaciers, waterfalls and geothermal volcanic features. On this workshop we photographed the spectacular coastal landscapes of the Snæfellsnes Peninsula and crystal clear glaciers and icebergs found at the Vatnajökull ice cap and Jökulsárlón glacial lagoon. We headed into the interior of Iceland along the scenic F208 road to the spectacular Fjallabak Nature Reserve where we stopped to photograph incredible landscapes. We also visited and photographed the surreal alien landscape at Veidivötn where volcanic craters filled with deep blue water dot the lunar landscape. The 2013 Iceland Summer Highlands Workshop was CPD (Continual Professional Development) accredited. For AIPP (Australian Institute of Professional Photographers) members that meant you automatically accrued CPD points toward your required annual target by attendance at the workshop. Please be sure to visit the Testimonials page for client feedback on what was an amazing workshop. In early May 2013 I lead an exploratory expedition into the Xinjiang Augur autonomous region in the extreme north west of China with my good friend Antony Watson. This is an extremely remote part of northern China that is home to the spectacular Tian Shan and Altay mountain ranges as well as the Flaming Mountains, Kanas Lake, Gobi Desert and more. This part of rural China is also home to the silk road and other historical locations of importance including the thousand caves of Buddha (two – three thousand year old caves). The province actually borders Russia, Kazakstan, Tajikistan, Pakistan, Kurdistan, Mongolia, and India so there is a real cultural mix of minority people and a very heavy Arabic influence. At one point during our travels we were only 60km from the Kazakstan and Russian borders. Many of the locations we visited were hundreds of kilometres from built up infrastructure and were well off the beaten tourist path. This remote region of China is rarely visited by the outside world and on several occasions we were greeted by local Kazak people who had never before seen westerners in their lives. It was an extraordinary and fascinating expedition with some truly spectacular landscapes. In March 2013 I co-lead a second winter Aurora workshop to Iceland with Moab Master Photographer Andy Biggs. This photography workshop focused on the spectacular Northern Lights (Aurora), glaciers, partially frozen waterfalls and coastal landscapes of Iceland. The days were starting to get longer in March, which provided wonderful golden light on what was often a freshly snow covered landscape. On this workshop we photographed the spectacular coastal landscapes of the Snæfellsnes Peninsula and crystal clear glaciers and icebergs found at the Vatnajökull ice cap and Jökulsárlón glacial lagoon. The weather conspired against and unfortunately we did not get to see or photograph the Aurora Borealis during this trip although we did experience some wonderful light and dramatic seas at the sea stacks at Vik. The 2013 Iceland Winter Aurora Workshop was CPD (Continual Professional Development) accredited. For AIPP (Australian Institute of Professional Photographers) members that meant you automatically accrued CPD points toward your required annual target by attendance at the workshop. Please be sure to visit the Testimonials page for client feedback on what was a successful workshop. In March 2013 I co-lead a winter Aurora workshop to Iceland with Moab Master Photographer Andy Biggs. This photography workshop focused on the spectacular Northern Lights (Aurora), glaciers, partially frozen waterfalls and coastal landscapes of Iceland. The days were starting to get longer in March, which provided wonderful golden light on what was often a freshly snow covered landscape. On this workshop we photographed the amazing natural phenomena of the Aurora Borealis (Northern Lights), spectacular coastal landscapes of the Snæfellsnes Peninsula and crystal clear glaciers and icebergs found at the Vatnajökull ice cap and Jökulsárlón glacial lagoon. The 2013 Iceland Winter Aurora Workshop was CPD (Continual Professional Development) accredited. For AIPP (Australian Institute of Professional Photographers) members that meant you automatically accrued CPD points toward your required annual target by attendance at the workshop. Please be sure to visit the Testimonials page for client feedback on what was a successful workshop. In October 2012 I launched a brand new photographic workshop to the icons of the Great Ocean Road in Victoria Australia. 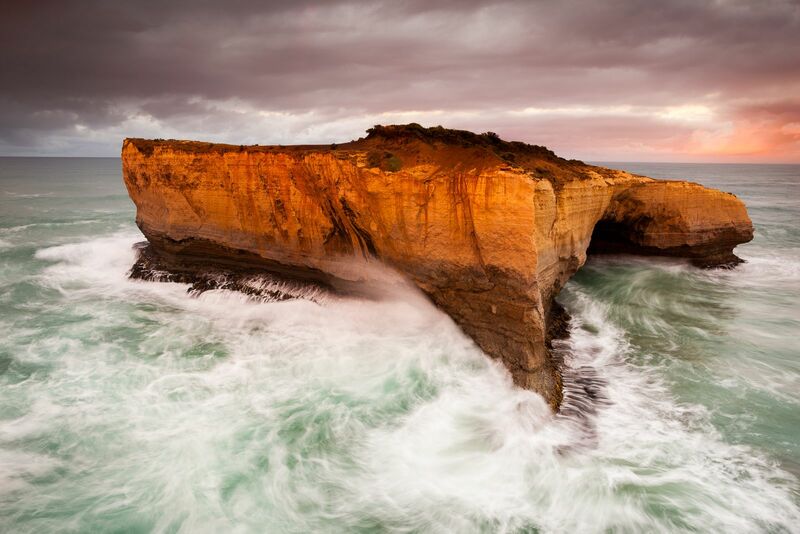 Perhaps best known for its mighty sea stacks at the iconic 12-Apostles, the Great Ocean Road is one of the world's leading tourist attractions and is packed with fantastic photographic opportunities. Perhaps nowhere else in the world is there coastline as unique and spectacular as that found along this stretch of Victorian coastline. Location highlights for this tour included Gibson’s Steps, the Twelve Apostles, London Bridge, Lochard Gorge, and Hopetoun Falls. We also visited quite a few lesser known locations including a Californian Red Wood forest plantation, the Shipwreck Coast and Cape Otway lighthouse. The 2012 Great Ocean Road workshop was CPD (Continual Professional Development) accredited. For AIPP (Australian Institute of Professional Photographers) members that meant you automatically accrued CPD points toward your required annual target by attendance at the workshop. Please be sure to visit the Testimonials page for client feedback on what as an amazing workshop. In July and August 2012 I co-lead a summer workshop to Iceland with Pro Nature photographer Daniel Bergmann. 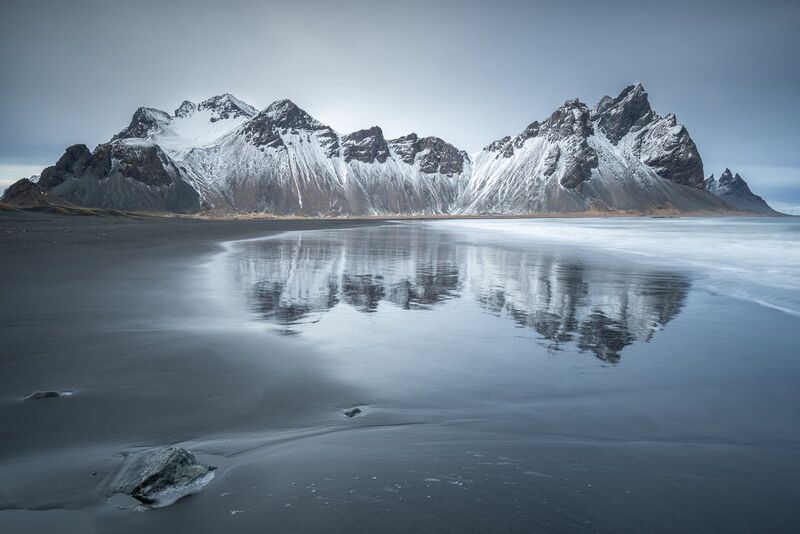 This photography workshop focused on the spectacular highland and coastal landscapes of Iceland. Normally inaccessible in winter, the interior of Iceland, known as the highlands, is an extraordinary place for landscape photography. It is a landscape of contrasts; wide vistas and pristine wilderness, mountain ranges, glaciers, waterfalls and geothermal volcanic features. 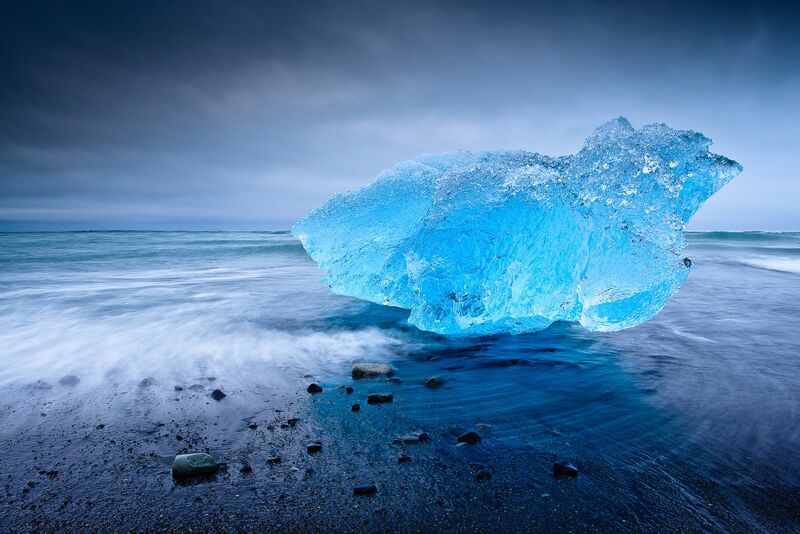 Iceland is one of the most exciting and rewarding photography locations in the world. Probably nowhere else is there such a diversity of subject matter in a relatively small area. Glaciers and geothermal areas, waterfalls and lush green valleys, majestic mountains and black volcanic beaches. Along with ever changing weather and spectacular light conditions. 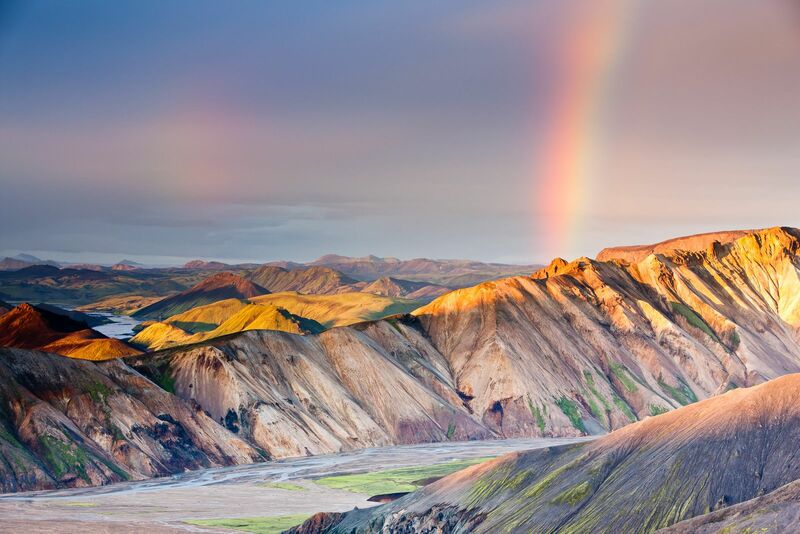 Iceland is geologically a very young country and very much a work in progress. 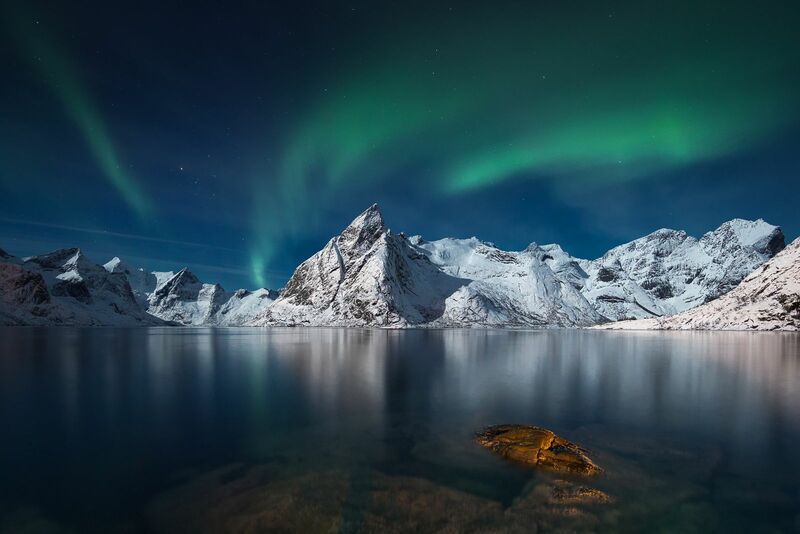 On this workshop we photographed crystal clear glaciers and icebergs, spectacular waterfalls and geothermal wonders under the spectacular midnight sun. Please be sure to visit the Testimonials page for client feedback on what was an amazing workshop. In November 2011 I participated in a group photography expedition to Antarctica with African wildlife photographer and friend Andy Biggs. The expedition set sail from Ushuaia at the bottom of South America aboard the 'Ocean Nova' and crossed the notorious Drake Passage to reach the Antarctic Peninsula where we spent a week exploring and photographing the Great White Continent. Location highlights for the expedition included The Gerlache Strait, Wilhelmeina Bay, Half Moon Bay, The Lemaire Channel and the surreal geothermal Deception Island. We visited and photographed some fantastic landscapes comprising of precipitous mountains and glaciers, snow fields and icebergs along with wildlife sightings including Penguins, Orcas and seals amidst a myriad of Antarctic Sea Birds. We also experienced a diverse array of Antarctic weather and light that included some of the most beautiful snow fall I have ever experienced. In the summer of 2010 I participated in a truly remarkable photography workshop to Iceland in conjunction with professional nature and landscape photographer Daniel Bergmann. 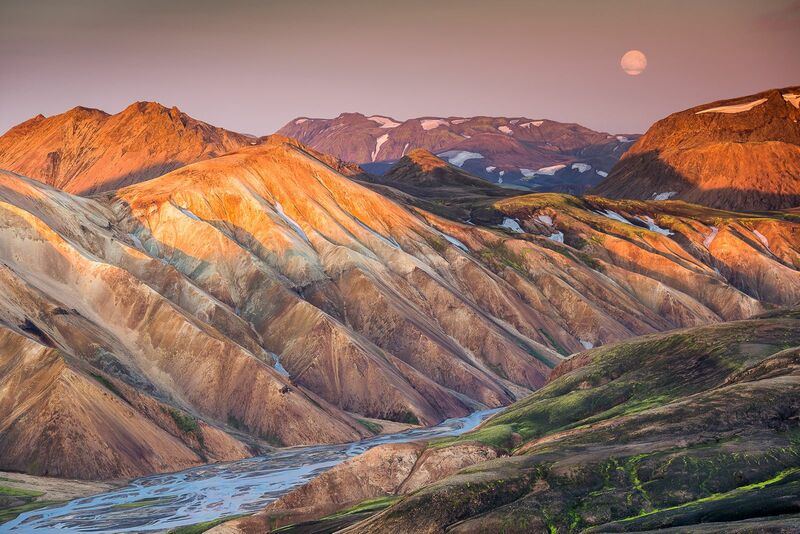 This workshop focused predominantly on the highland and coastal regions of Iceland including the spectacular and unique Jokulsarlon glacial lagoon, the geothermal and volcanic highlands of Landmannalaugar and Veidivotn, the remote and awe inspiring Volcanic craters and calderas at Askja in the remote central highlands and many of Iceland's most impressive and dramatic waterfalls including Godafoss, Selfoss and the mighty Dettifoss. We were fortunate to experience some dramatic light under the midnight sun in some of the world's best locations for landscape photography. Deep in the winter of 2009 I participated in a photography workshop to the South Island of New Zealand in conjunction with professional nature and landscape photographer Phillip Bartlett. The South Island of New Zealand is home to lush forests, waterfalls, spectacular mountains and glaciers and has unique stretches of truly wild and rugged coastline that make it a photographic paradise. 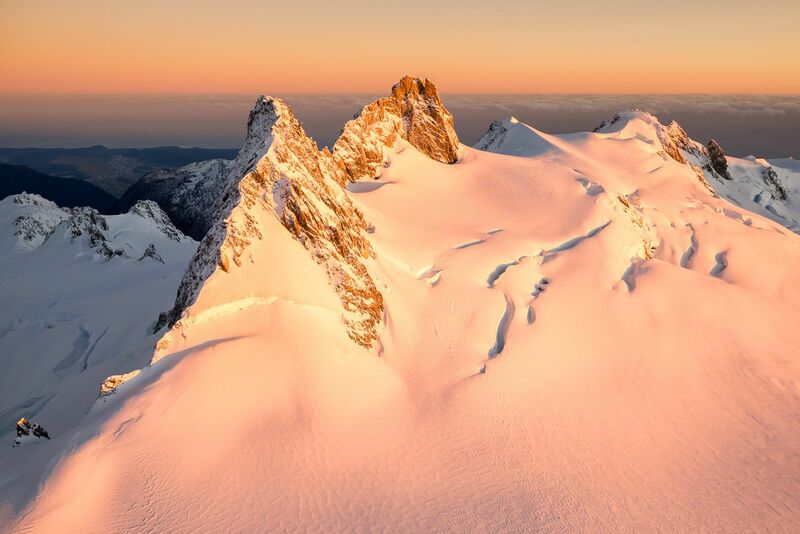 We were fortunate to experience some fabulous weather and light throughout the trip including some outstanding alpine glow at Mount Cook and Mount Tasman. This workshop included multiple helicopter photography sessions over the Alps and glaciers including Mount Cook, Mount Tasman, Fox Glacier and Franz Josef Glacier. We also landed on Fox Glacier to explore and photograph the ice caves.